Visiting Italy for the first time and not sure where to go? 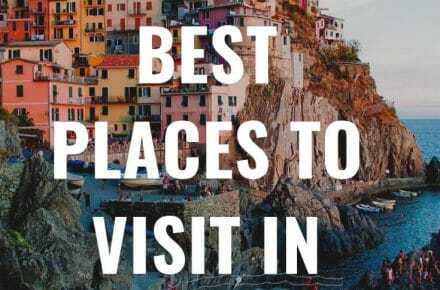 These are the best places to visit in Italy! Be sure to read this before you go. Italy is one of my very favorite countries in the world. I have visited several times to see different parts of the country and every trip I’ve taken has been completely different. Italy is around the same size as California, with just as much diversity too. The country is so big, that choosing where to go can almost be overwhelming. The best places in Italy will be where you leave your heart and want to return to again and again! If you want a prepackaged Italy itinerary, check out these 5 amazing itineraries I’ve made. 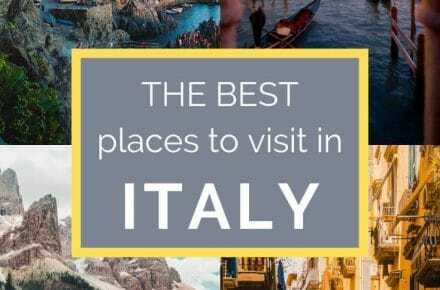 If you’re planning a trip to Italy, but don’t know where to start or where to go, take a deep breath and read this incredible list! These are the best places to visit in Italy. Some you may have heard of, but most will be new to you. 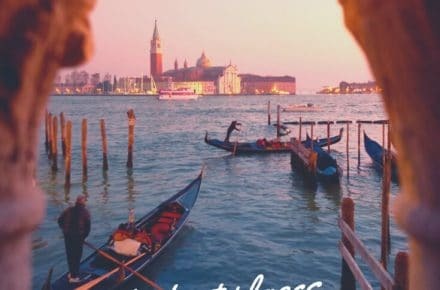 While visiting the iconic Italian cities such as Florence, Venice, and Rome is essential for your first trip to Italy, it’s great to get off the beaten path a little bit and try some new destinations that will be equally rewarding and at the same time, help with over-tourism in more popular cities. Some of the best cities in Italy may be the ones you’ve never thought to visit! And if you’re taking a complete tour of Italy (lucky), you can hit these stops along your way. I guarantee you will fall in love with this beautiful country. The history, food, culture, architecture, and scenery will entice you to come back again and again. Italy really does have something for everyone! The best way to learn about a country is to actually visit it, but it can be fun and helpful to do some research before you go. I thought I would give you some interesting facts about Italy to help you prepare for your trip! Italy has three active Volcanos: Vesuvius, Etna, and Stromboli. They are the only active volcanos in Europe. In Italy, children legally had to attend school until they were only 14. This ended in 1999. Fourteen Billion espressos are consumed in Italy each year. Batteries were invented in Italy. Italy comes from the Greek word “Italos” meaning legendary king. The first thermometer was invented in Italy. Italy is a relatively new country at only 153 years old. Pinocchio, written by an Italian, was originally published in a newspaper. Many of Shakespeare’s plays are set in Italy. Pizza was invented in Naples. Pasta has been eaten in Italy since the 4th Century CE. Italy has more UNESCO World Heritage Sites than any country in the world (50). Italy is the 4th most visited country in the world. Now you know a few interesting facts about Italy to help get you started on your journey. 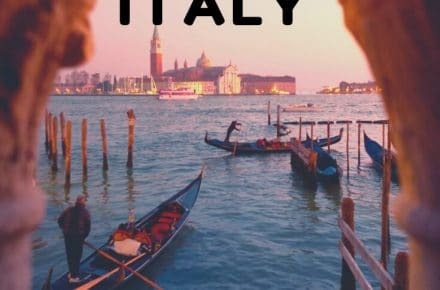 There are so many places in Italy as well as so many things to do in Italy, that you’re going to have an amazing time no matter where you choose to go or what you choose to do! I honestly have never met anyone who hated their time in Italy. And if they did, they did it wrong! I know this list of places to visit in Italy is long and may seem daunting. Don’t feel like you need to see all of these destinations at once. Decide where to go in Italy…pick one city or one region and spend time getting to know it. Talk to the locals, eat the food, walk the streets, and of course, eat ALL the gelato! If you’re a visual learner like me, I’ve made this map of Italy with cities from this list to help you decide where to go. You can download this map for yourself if you like. In my opinion, the best way to get around Italy is by train. Train travel in Italy is super affordable, fast, efficient, and clean. There are even some overnight train options that are great. 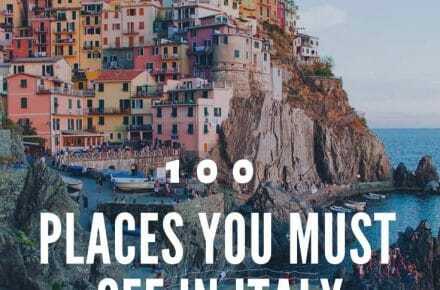 So without further ado, here are the 70 best places to visit in Italy! Alberobello is a gorgeous little town in Puglia in the South of Italy that will have the kids’ imaginations firing on all fairy tale cylinders. 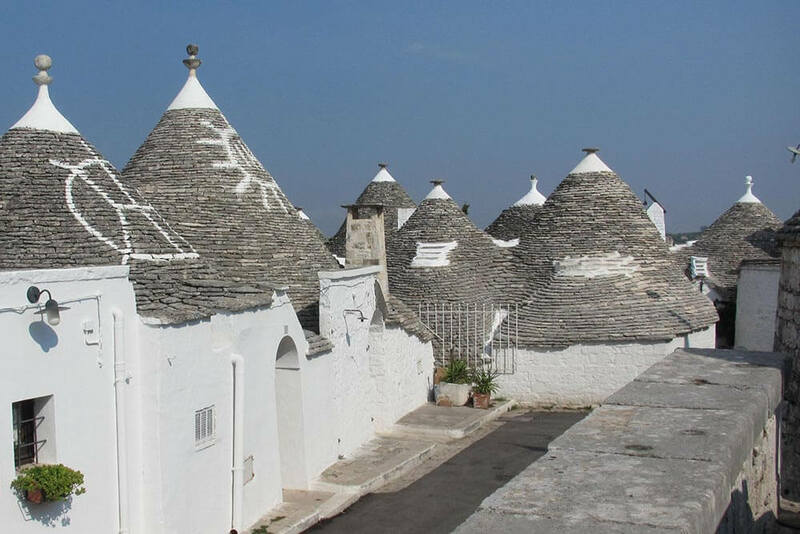 The UNESCO listed world heritage site is most famous for its traditional houses known as trulli (the plural of trullo) an example of prehistoric construction techniques that have survived and are functioning in the modern era. The 1500 snow white limestone huts dating back to the 14th century are only part of the town’s substantial charm. 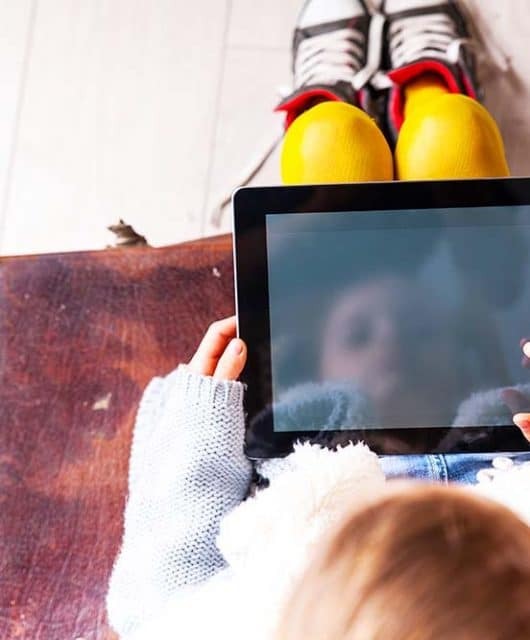 Narrow walking streets, gorgeous little providores stuffed to the brim with incredible local produce and exceptional kid-friendly al fresco dining add to the experience. 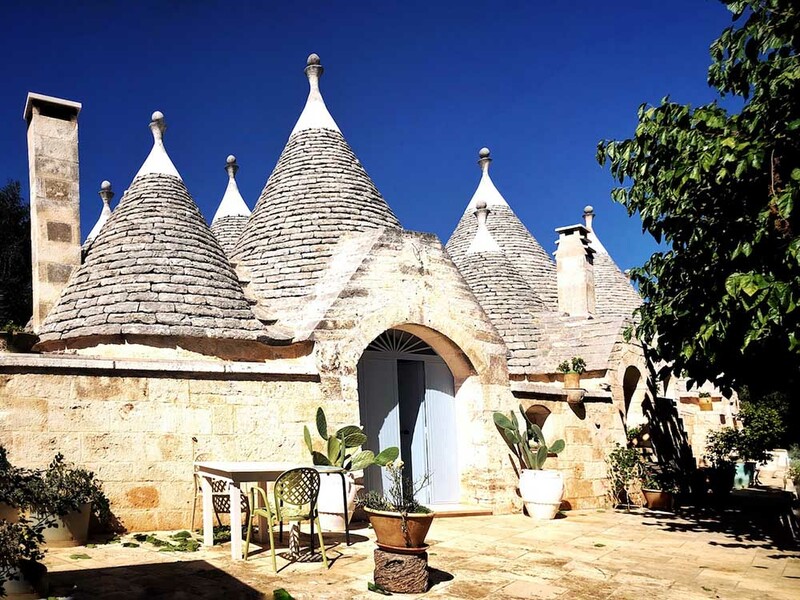 One of the best ways for families to enjoy the full Alberobello effect is to book a stay in one of the pretty storybook huts. 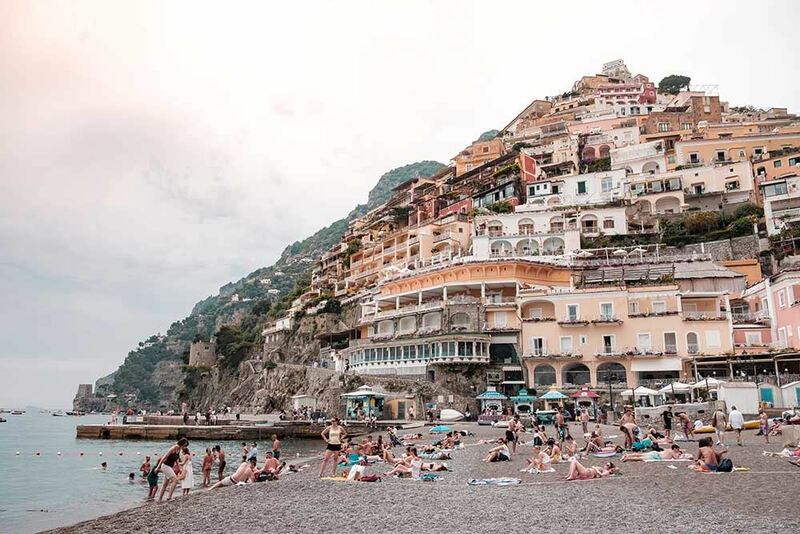 Right in the heart of the Amalfi Coast, the town of Amalfi is one of the best places to visit in Italy. Perfectly positioned for exploring the coastline and taking day trips to Capri, Amalfi also has unique attractions of its own. Though not as dramatic as nearby Positano, colorful houses look over the sea and there are is a labyrinth of cobbled streets to explore. Take some time to explore the magnificent cathedral with its ornate facade and Baroque interior. Afterwards, you can enjoy a coffee or spritz at one of the busy cafes surrounding the cathedral or head to one of the beach clubs for some time in the sun. 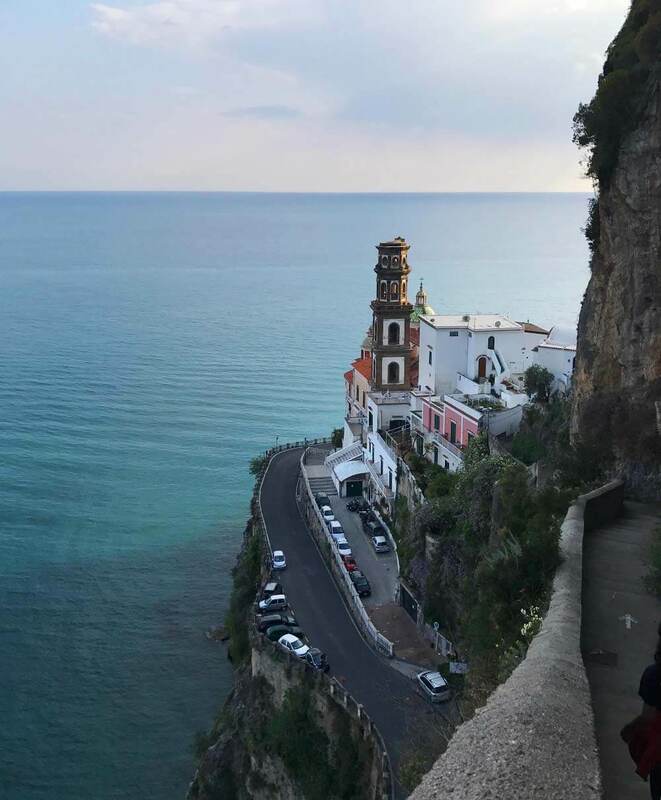 But perhaps the best thing to do in Amalfi is to stroll along the cliff top towards Atrani for magnificent views of the Amalfi Coast. Are you planning a trip to the world’s most famous boot – AKA the Italian Peninsula – and wondering where to go? Well well my dear reader, forget about Florence, Rome, and Venice and come all the way to the south, where a stunning region is waiting for you. Apulia is one of the best cities in Italy! Ever heard about Apulia? Before you keep reading this paragraph, please bear in mind that I am not saying that it is the most beautiful spot to visit in Italy just because I was born and raised there, but because it really is! Among the most incredible places you should not miss in Puglia, there are Lecce, Bari, Alberobello, Ceglie Messapica, Ostuni, Otranto, and Gallipoli. Need a piece of advice? Rent a car and drive away! From the Itria Valley and its unique Trulli hubs to the crystal clear waters of Porto Cesario. Once is Puglia every little detail will be just amazing. Do you want another piece of advice? Try to lose some weight before coming here: you will spend so much time eating! The town of Assisi sits on a hilltop in Umbria, southeast of Tuscany, and is best known as the birthplace of Giovanni Francesco di Bernardone, the future St Francis of Assisi, lover of nature and animals. 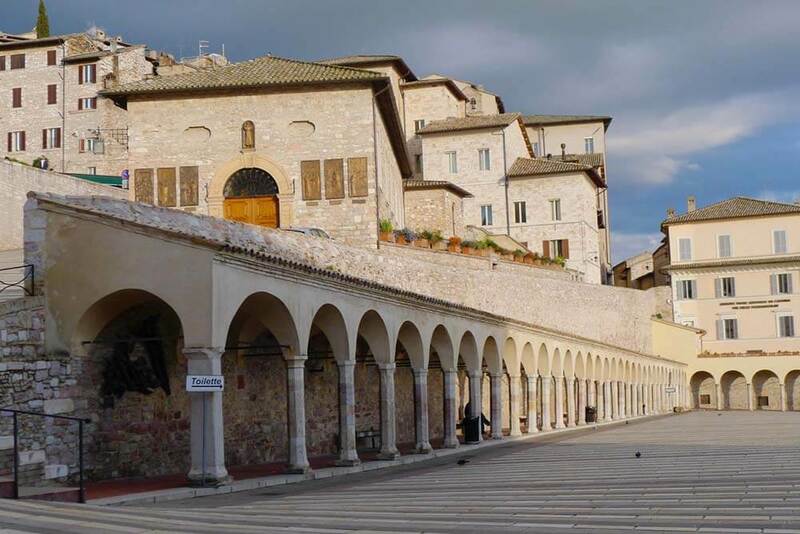 Assisi has many of the trappings of a small Italian town – churches, of course, with more frescoes than you can shake a paintbrush at, but also medieval castles (two), a Roman amphitheater, ancient winding streets, excellent food and sweeping vistas across the valleys that surround it. Mostly it is a place of pilgrimage, with monks milling among the day-trippers who have come to visit the famous Basilica, built in the 13th century but severely damaged in 1997 by an earthquake aftershock. The vault collapsed, frescoes were destroyed and several people died, a sad memory belying the beauty of this place. It took two years to rebuild and reopen the Basilica and today the damage is barely visible. Barbaresco is not only the “little brother“ of the wine Barolo, but it is also a unique medieval village in the southwest of Piemont. The area Langhe Roero, where Barbaresco is located was recently added to UNESCO worlds heritage list. El Torre di Barbaresco is the breathtaking spot to enjoy a panoramic view of the landscape of Langhe-Roero. The desecrated church San Donato houses an Enoteca, the perfect location to taste the vines of the region. In the hiking or e-cycling route “bar to bar” is an alternative for those without a car to enjoy and explore this magnificent area. A fantastic view, culture, and indulgence united in one place make Barbaresco a place worth to visit in Italy. One of the top places to visit in Italy for wine lovers has to be Barolo in the Piedmont region. The Piedmont region is in the northwest of Italy, close to both Milan and Turin. The tiny village of Barolo is well-known for Barolo wine, some of the most prized wines in the world. There are several wineries that you can visit in Barolo including Bruno Giacosa and Massolino. Or, check out AgriLab, which is in the village of Barolo. It’s a small shop and wine education center near the Barolo caste. The AgriLab wine center offers a good selection of Barolo wines. You can purchase a card that allows you to taste several in one visit. The food in Piedmont is unique from other regions within Italy. Italian food differs by region, and there are so many different types of cuisine depending on where in Italy you travel to. One of the reasons why the food in Piedmont is unique from other regions within Italy is because of the local ingredients. The most important local ingredients include rice, truffles, cheese, and even hazelnuts. One of the most popular Italian food products has to be Nutella, the chocolate hazelnut cream that is from Piedmont. But, there are amazing local artisan producers of hazelnut cream that are a must eat in Barolo. As for must-eat dishes in Barolo, try the Agnolotti del Plin, a stuffed pasta, or Tajarin, a flat pasta often served with a Barolo-based ragu. If you are looking for a beautiful hidden gem then head to Bergamo. Bergamo blew me away by its beauty – and most of all, I had never expected it to be so charming. 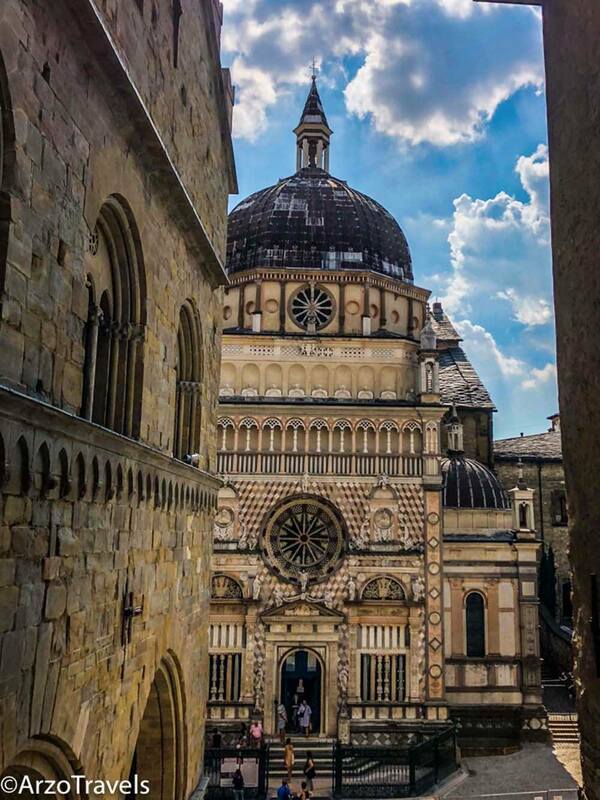 If you have one day then you can explore the beautiful upper town, Citta Alta, and enjoy Bergamo´s main sights. After strolling the Venetian Walls, consisting amongst others of 14 bastions and four gates, is over six kilometers long and walking there offer great views of the lower part of the city. 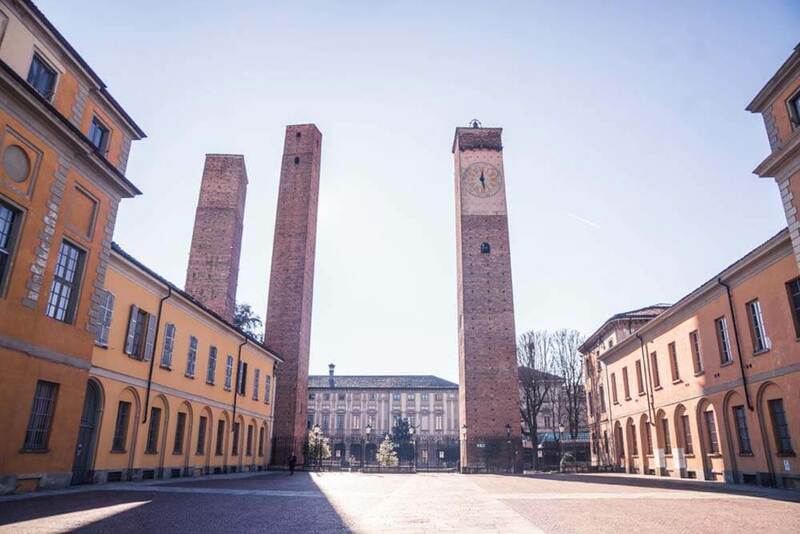 Also, make sure to head to the pretty market square, Piazza Vecchia, of the city with the Campanone Tower and just behind the square you will find the prettiest building in the city: Colleoni Chapel. You might have to enter the chapel to fully get the beauty – but the interior is stunning. 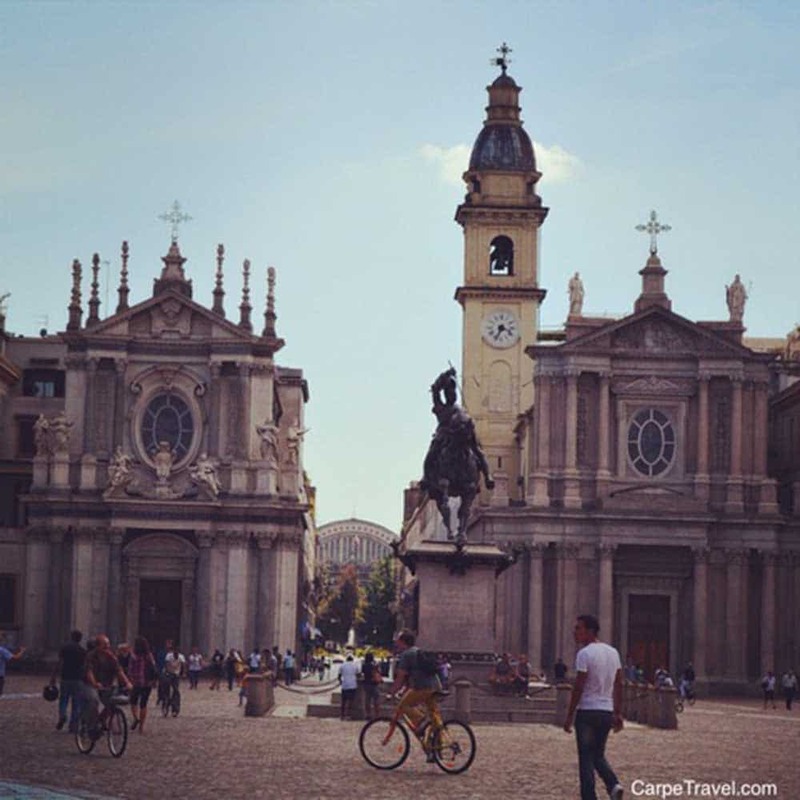 Bergamo is such an underrated place in Italy – and yet so pretty! Locked between Florence to the south and Venice and Milan to the north, the medieval city of Bologna often gets overlooked by many travelers. Bologna nicknamed, “La Dotta, la Grassa e la Rossa” has many things to see and eat! The city, “la Rossa”, is characterized by its red hue that covers all its buildings. “La Dotta”, the wise one, for the University of Bologna, the oldest university in the Western world; this is one of the must-do and is what brings the city alive. Besides its picturesque red hues and the university, the city has more than 600 porticos which are ranked in the UNESCO World Heritage sights. To get the views from above, climb the countless stairs at the Asinelli Tower. Bologna, Italy may be one of the most underrated cities in Italy, which is surprising given its prime location just an hour away from Venice and Florence, two of the most popular tourist destinations in the country. Its nickname of La Dotta, La Grassa, and La Rossa (the educated, the fat, and the red) defines the city well. Bologna is home to the oldest university in Europe, and the iconic red rooftops of the city create a memorable landscape. 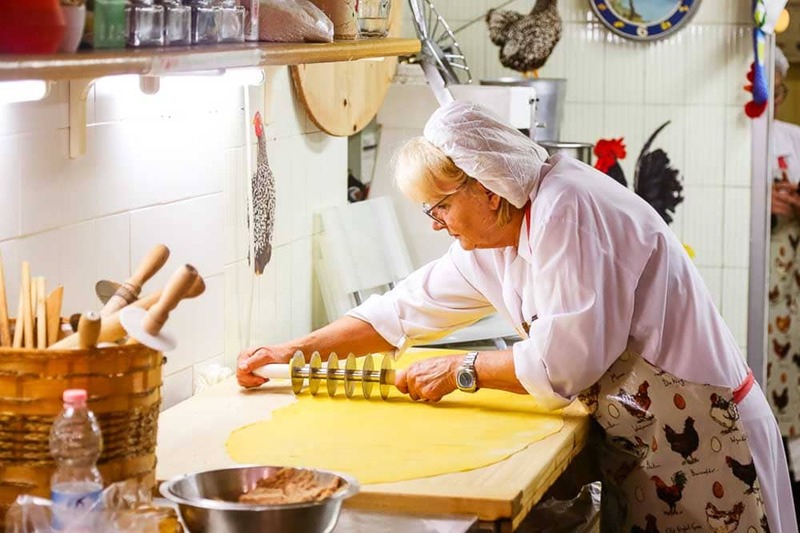 But perhaps most apropos is La Grassa — the fat — as in recent years, Bologna has arguably become one of Italy’s leading culinary cities, a perfect destination for foodies. First time visitors to Bologna will notice is the incredible amount of well-reserved medieval architecture, making you feel as if you’ve stepped back to the Middle Ages. With nearly of 25 miles of beautiful covered porticoes, you can enjoy exploring the city, even in inclement weather. There are a million reasons to visit Bologna whether you’re looking for good food, arts, culture, wine, nature, or simply strolling one of the most beautiful cities in Italy. Bolzano isn’t the typical Italian city that every traveler has on the bucket list. 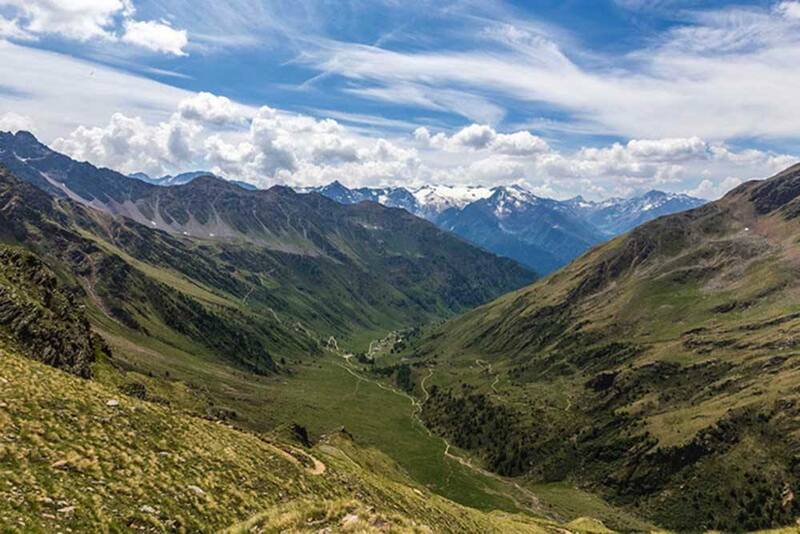 But if you plan to explore the Italian Alps and go hiking, then it must be on your trip itinerary. In fact, Bolzano is known as a hub and a getaway to many hiking trips in the Northern Dolomites. I highly suggest spending at least a whole day to visit Bolzano. It’s one of the best places to see in Italy! Explore the center of the city on foot and stroll to Walther Square, with its beautiful flowered fountain and admire the cathedral on the southern corner, which stands out for the Gothic architecture and its gorgeous emerald green and yellow tiled roof. 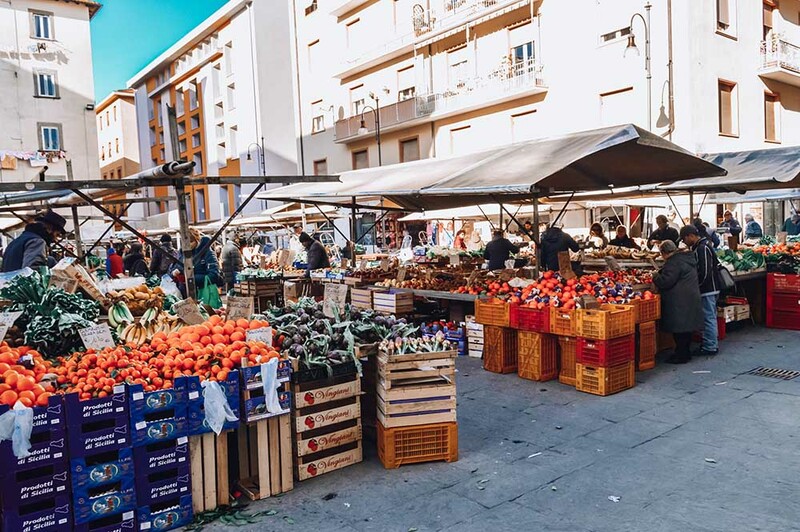 From there head to the Mercato Delle Erbe, an iconic place in Bolzano, only a few hundred meters away to dive into the buzzing herbs, fruits, and veggie market. This is the best place to see old buildings and sit in pubs to enjoy the typical Italian Tyrolean food, drink a beer, and taste premium wines. 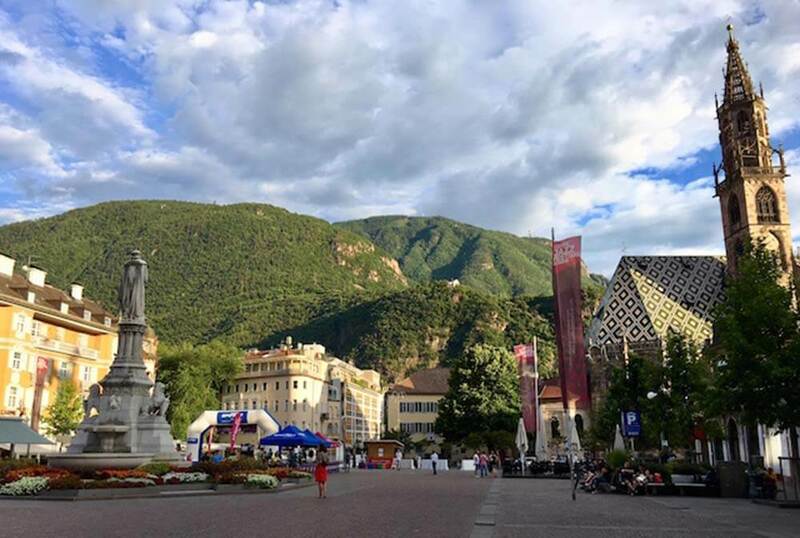 While there are many more things you can do in Bolzano, it is advisable to plan a multi-day itinerary in South Tyrol to visit the northernmost city of Italy. The bright and beautiful Venetian island of Burano certainly lived up to expectations when I visited it. Arriving on the crowded Vaporetto (water bus) in the early afternoon I was concerned that the island would be overrun with crowds of tourists spoiling any photo opportunities but I needn’t have worried as the tourists kept firmly to the tourist trail leaving me with the equally beautiful backstreets almost all to myself. Burano is famed for its brightly painted yet rustic looking fisherman’s houses that line its picturesque canals, painted this way so the tale goes, so that the men could find their way back to the right house after one too many a drink! The island is also known for its leaning bell tower and its lace needlework, though sadly this does seem to be a dying art with fewer and fewer old ladies sitting outside their doorsteps working on their handicraft. 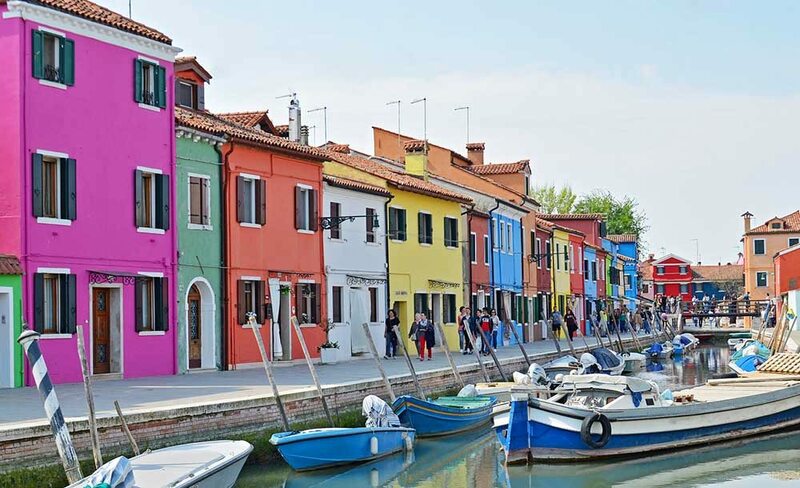 If you’re captivated by color, don’t just visit Burano for the day, stay here for a few nights to get the full effect! It has a more down-to-earth vibe than Venice being more artistic than aristocratic, poor rather than pompous but just as enchanting, and in some ways better! Sardinia is one of best places to go in Italy if you’re looking for something a little different. 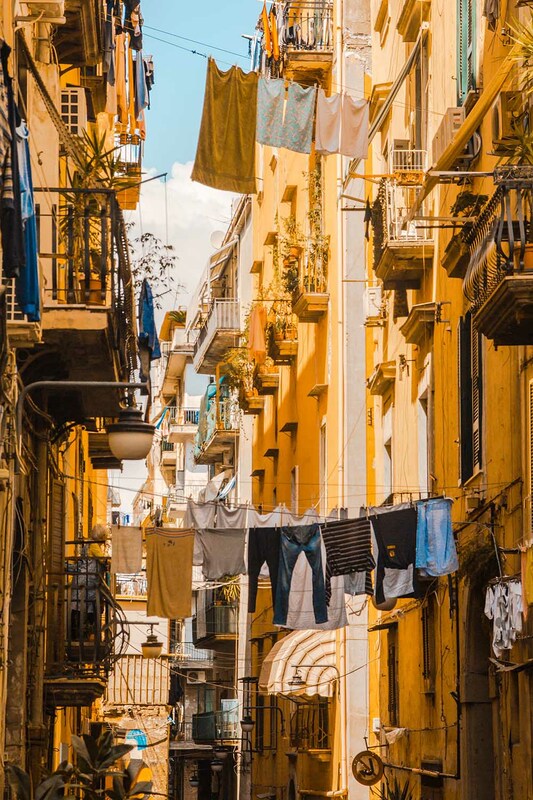 Often overlooked for other more famous and easier to reach places in Italy, Cagliari, the capital of Sardinia, the famous island off Italy, never disappoints visitors. 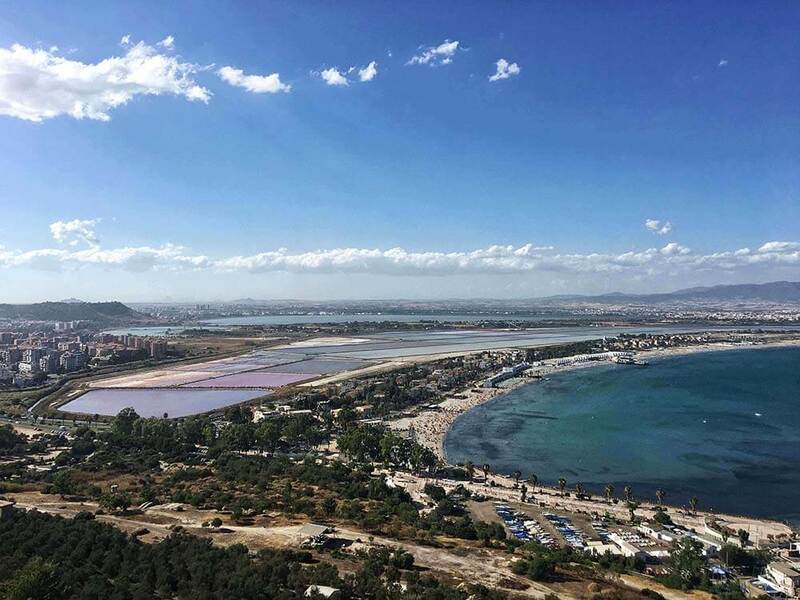 Between the Mediterranean sea and the hills, with some incredible archeological sites and easy access to nature, Cagliari is the perfect base to explore the rest of Sardinia and makes for a fantastic long weekend getaway. Among the many things to do in Cagliari, make sure to head to Castello, the prettiest historical district, to visit the museums, churches and the two watchtowers. 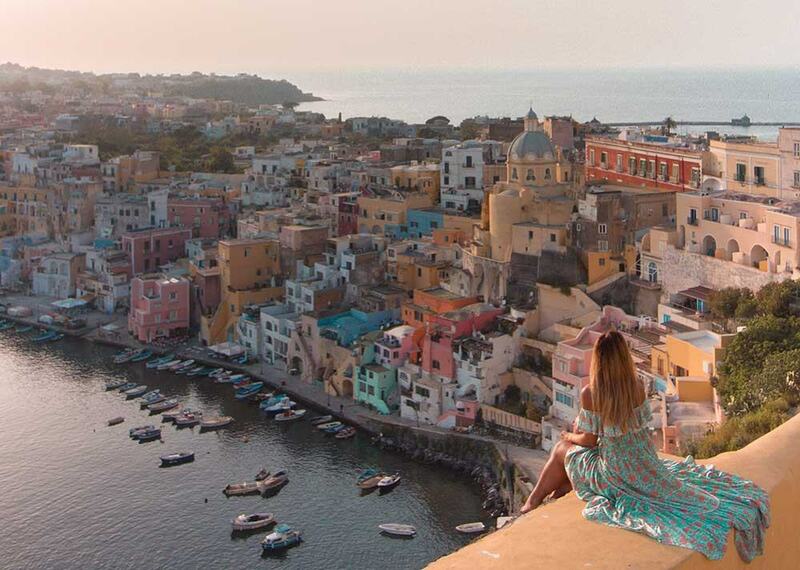 Once you are done, head to Bastione for a gorgeous view of the city and the bay, then head to Via Santa Croce for one of the prettiest sunsets you are going to experience in your life. Capri, Italy is one of the most unique and beautiful destinations in all of Italy. Located off the southern coastline near the Sorrentino peninsula, Capri is reached only by boat, and ferries from Naples, Sorrento or the Amalfi Coast can get you there several times a day. Many tourists visit Capri on a day trip, though spending a few days is much more fun. 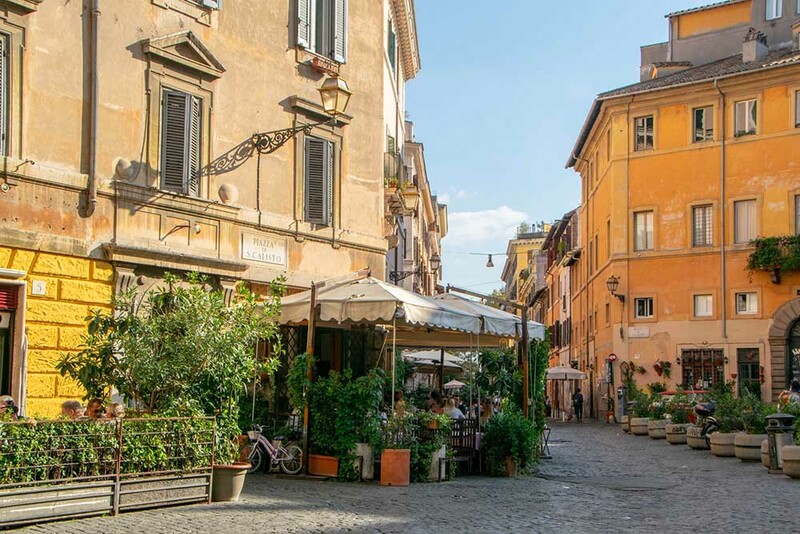 You’ll be able to enjoy early morning and late afternoon walks around the island with fewer crowds, and enjoy dinner in the Piazza Umberto, also known as La Piazzetta. Capri is known for its high end, designer shops and casually elegant eateries, but there are many activities which revolve around the crystal blue waters that surround the island. Taking a boat tour to the Blue Grotto is an Auber-popular attraction but almost a requirement to see the unusual glowing blue water in the cave. Or join a small boat tour and spend the day living la dolce vita, swimming in the gorgeous water and noshing on some Italian food and wine. 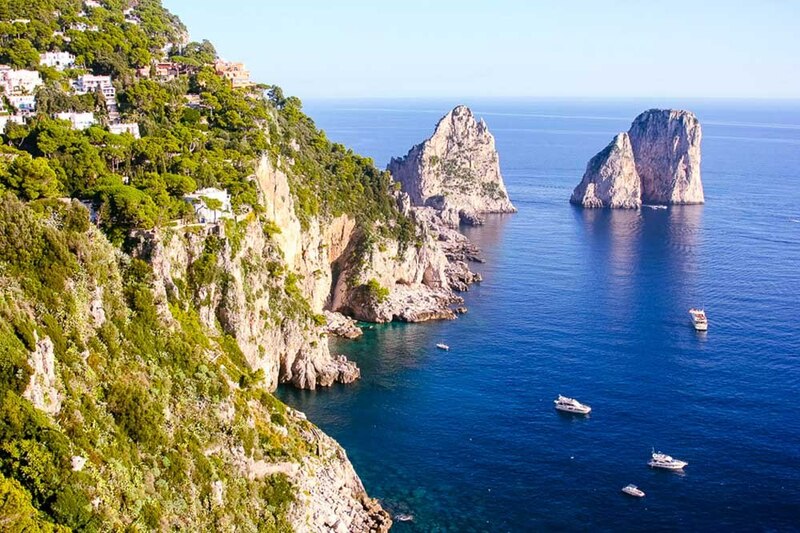 Whatever you choose to do in Capri, it’ll capture your heart forever. 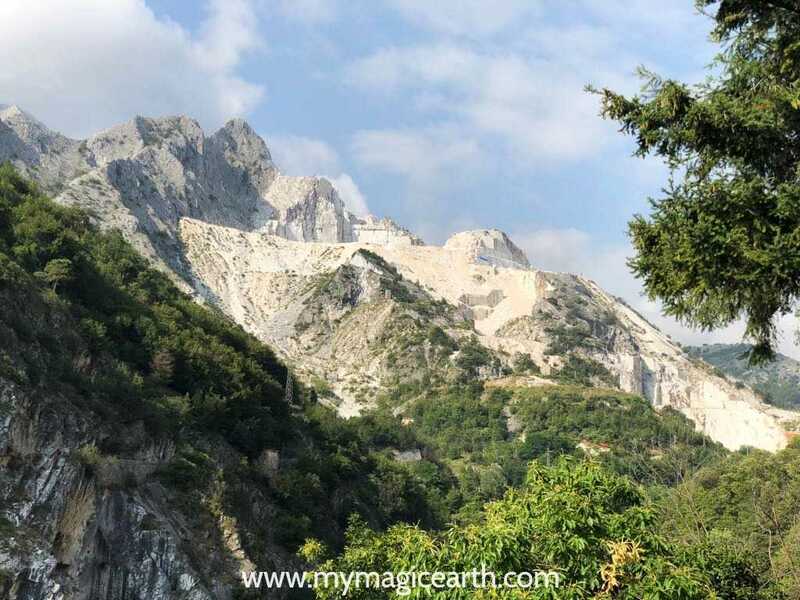 The Marble Route near Carrara (northern Tuscany) passes through the marble mountains, tunnels, a local village built for marble diggers, and the Remains of Roman Quarries. Along the marble route, one can see marble quarries and drive on the winding roads that lead to them. Those marble quarries were made even more famous by the film “007 Quantum of Solace”, starring Daniel Craig and directed by Marc Forster. Some of the film’s most memorable scenes were shot there. We made a self-driving through the marble route. it is quite difficult to find the way without a guide. Some places are not well sign-posted. Besides, an off-road car is recommended for driving on some unpaved roads. Please read our review here.There are many guided off-road tours. The Exclusive Marble Cave Jeep Tour Adventure provides you an inside view of the marble culture and industry. It may offer the chances to visit a working quarry. If you are having a holiday in Viareggio, you can join this tour, Carrara Marble Tour Small Group from Viareggio. The Tuscan hill towns are justifiably famous, and I think the best one may be one you’ve never heard of: Certaldo. This beautifully preserved Medieval walled town about 35 kilometers southwest of Florence sits atop a hill with gorgeous views of the surrounding olive groves and vineyards. Ride the little funicular up into the old center, where the picture-perfect terra cotta streets are free of traffic and free from the crowds that you’ll encounter elsewhere in Tuscany. 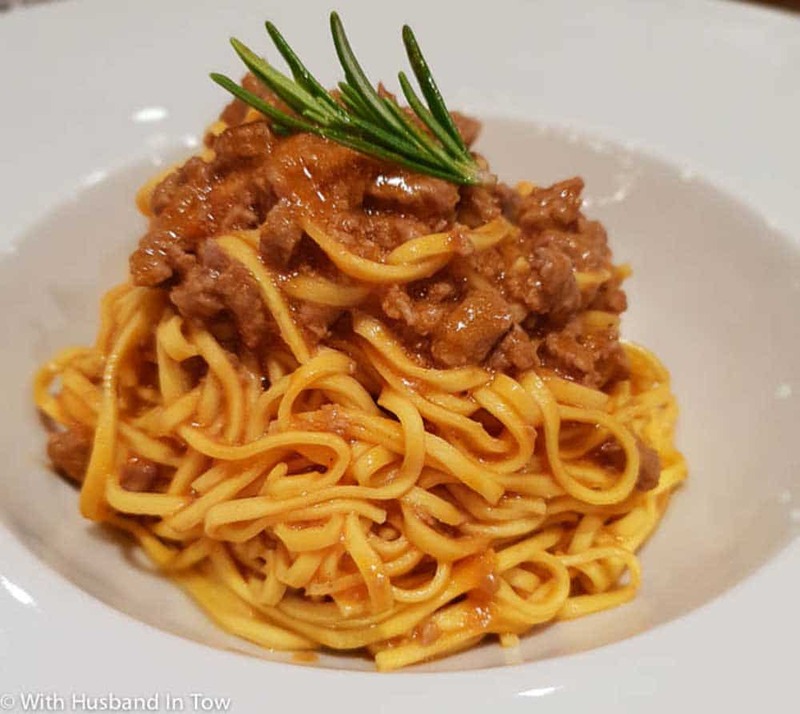 There are a few sights that you should see, including the Palazzo Pretorio with coats of arms on its castle-like exterior and the home of the Italian poet Boccacio, and lots of amazing restaurants serving dishes made with the famous local Cipollo onion. But the real highlight of Certaldo is simply wandering the peaceful maze of streets and soaking in that la dolce vita. 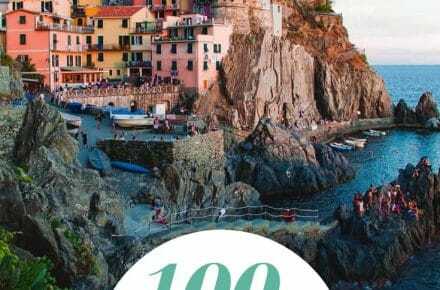 If you’re looking for the best places to visit in Italy you have to add Cinque Terre to your travel bucket list. The Italian name Cinque Terre translates to “Five Lands” in English and refers to the five coastal towns of Monterosso, Vernazza, Corniglia, Manarola, and Riomaggiore. The area is a National Park and there are other small towns dotted around it, but the five towns along the coast are the most famous and visited. The five coastal towns are connected by a cliffside hiking trail known as the Sentiero Azzurro (Blue Path). 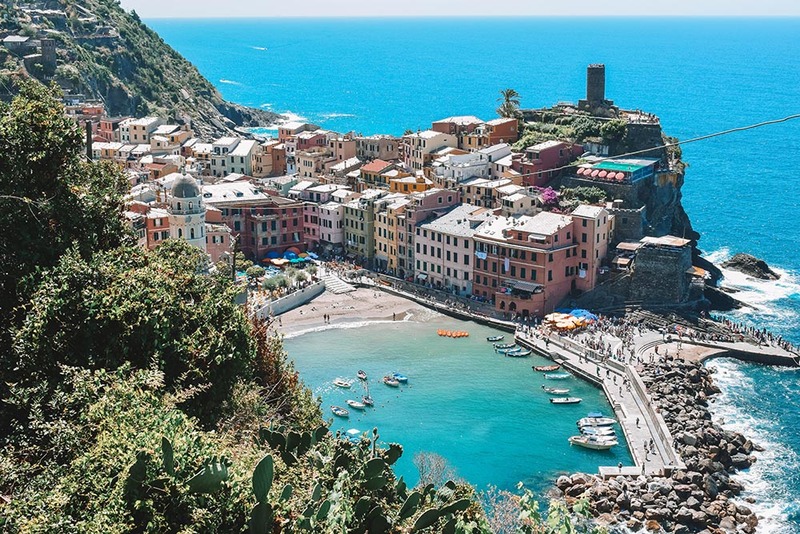 Hiking along the Sentiero Azzurro and visiting the five towns of Cinque Terre is one of the most popular activities in Italy, and it’s easy to see why! 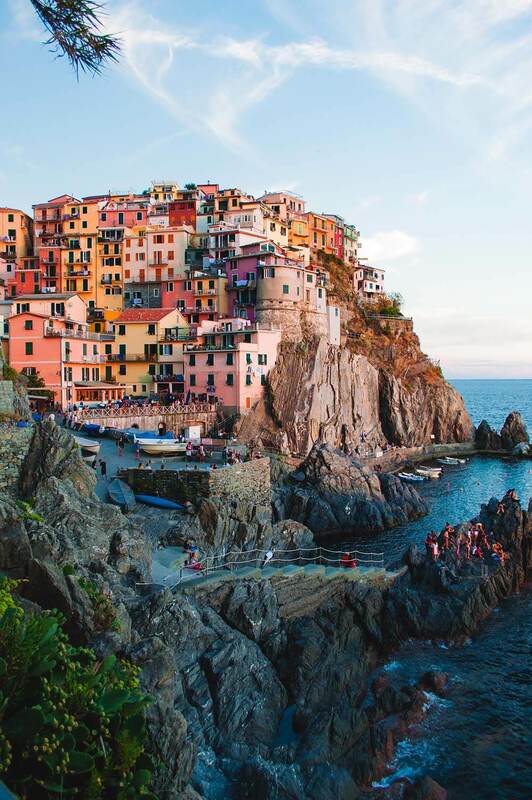 With their iconic colorful houses perched on top of steeps cliffs, which drop off into the turquoise sea, the towns of Cinque Terre have marveled travelers for years. 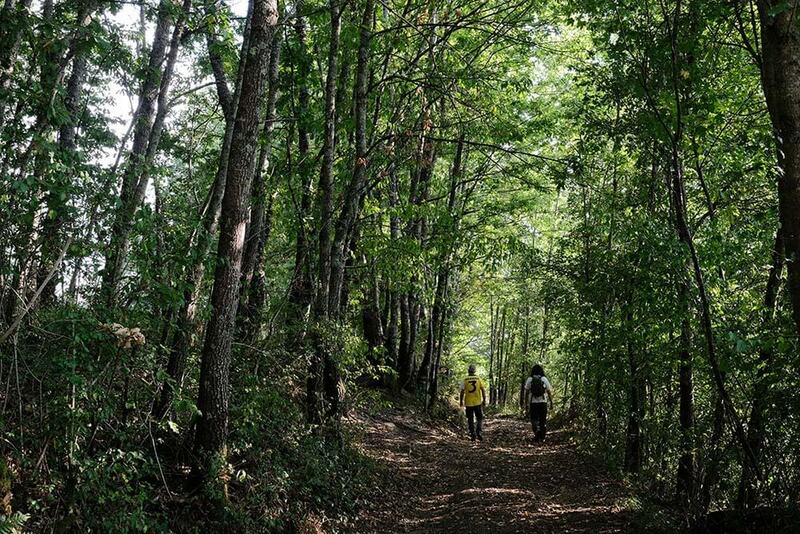 The total Sentiero Azzurro hike is 12km long, with lots of ups and downs amongst vineyards and olive groves. The trail isn’t always well beaten, with rocks and roots jutting out so make sure to wear comfortable trainers for the hike! If you don’t want to hike 12km you can get a hop-on-hop-off train ticket, that allows you to travel between the towns by train. Entry to the National Park is 8 EUR just for walking access to the park, or 15 EUR for entry to the park with the hop-on-hop-off train option too. 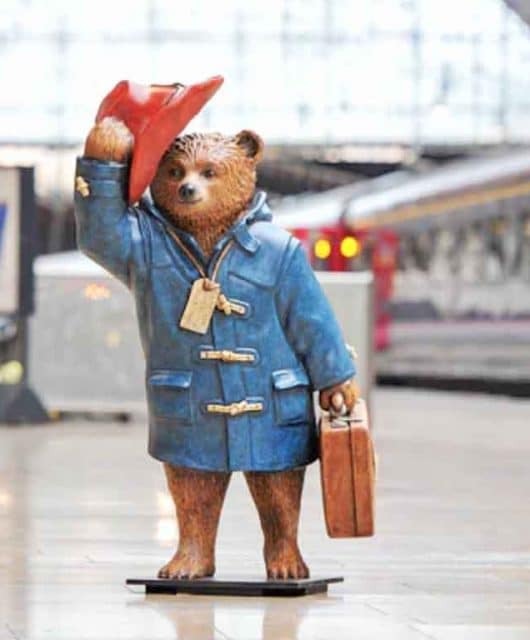 Read more about using train travel in Italy. For two summers in a row, my family and I visited Cortona, a beautiful hilltop town in the southeastern part of Tuscany. We loved it so much the first time, that we booked a second trip the following summer. It’s best known as the setting for the movie Under the Tuscan Sun, and it’s said that many filmmakers choose to film in Cortona due to its off-the-beaten-path location, away from the crowds. Indeed, that’s what we loved about this charming fortress town as well – less people, which meant plenty of easy wandering through the picturesque, medieval streets, and plenty of crowd-free views of the valley below. 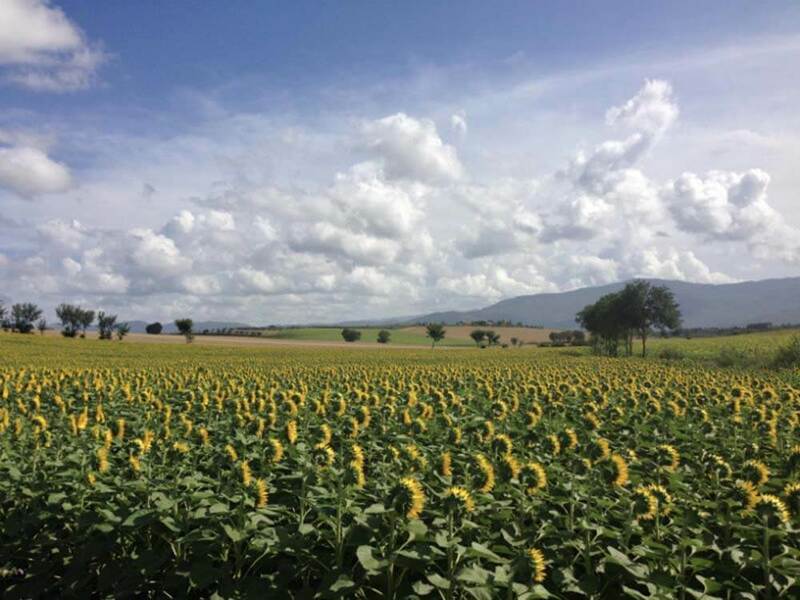 Cortona is surrounded by exquisite countryside, exactly what you think of when you think of Tuscany: rolling hills, sunflower fields, farmland, and a peacefulness and beauty not quite found anywhere else. We rented a villa in the Cortona valley on both trips, spending our time there as well as jaunting off on day trips to other villages. 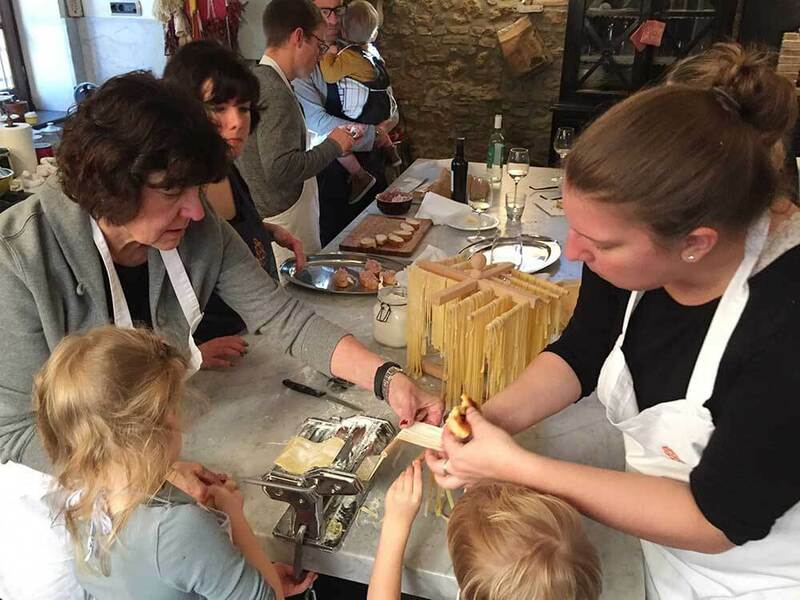 Cortona is a special place for my family, and I wouldn’t be surprised if a third trip pops up again in the future! 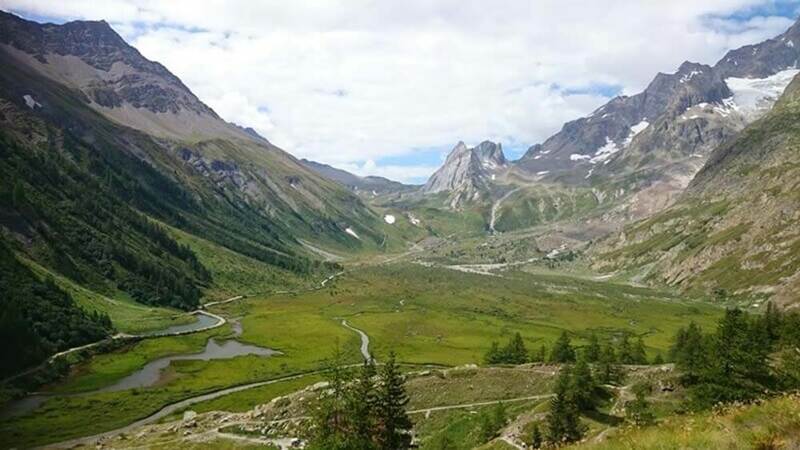 Courmayeur, nestled in the Italian Alps, is the perfect town to visit if you are passionate about the great outdoors. Often overlooked in favor of it’s bigger neighbor, Chamonix, in France I prefer it’s more quiet, more traditional vibe. Alongside the abundance of hiking, cycling and climbing on offer, there are plenty more relaxing options too. Visit the QC Terme Spa in nearby village Pre Saint Didier. There are over 40 different spa experiences and the highlight is relaxing with the spectacular mountain views in the outdoor pools that are filled with warm water from natural thermal springs. If you are not big on walking but would still like to get some elevated mountain views you could take a trip up the impressive Skyway Monte Bianco Cable Car. It has a unique revolving cabin that gives you 360-degree views. At the first platform, wander over the to the beautiful Saussurea Alpine Botanical Garden. Or you could hike, or take the cable car, up to Europes highest swimming pool at the outdoor Lido at Plan Checrouit. Not to forget the many great bars and restaurant the town has allowing you to sit back and enjoy an Aperol Spritz after a day out. One of the most scenic mountains in the world is the Dolomites. It is an amazing place to visit. The hike in the area is very accessible. The trails are clearly marked. 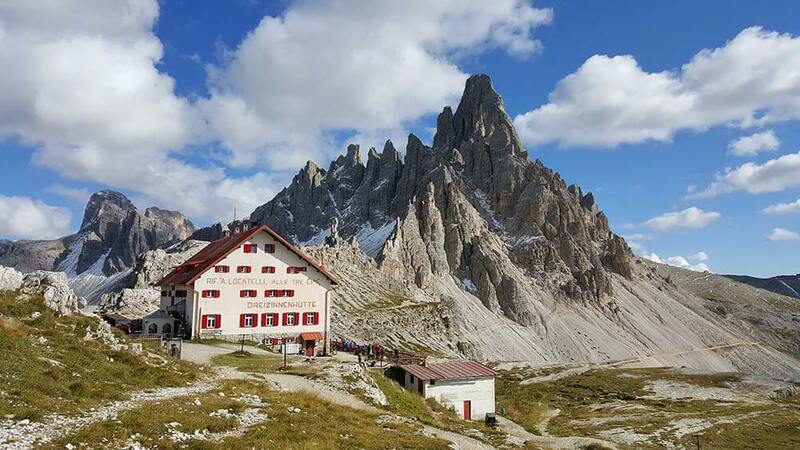 The Tre Crème hike is one of the most iconic views in the Dolomites. This day hike can be done in 3 to 5 hours depending on the route. It can be quite busy in the summertime. Another great hike is Lago Sorapis. This gorgeous turquoise lake is a full day hike, but worth the effort. The best part is that on many of the hikes small Rifugios are dotted through the mountains. These mountain huts provide dorm rooms and have restaurants. In the middle of the hike, you can stop for an ice cold draft beer and some delicious food. The Dolomites are one of the best places to travel in Italy and should not be missed if you love nature! Did you know that Tuscany has an island? It is called Elba island and it is situated 10km away from the coast of Italy. 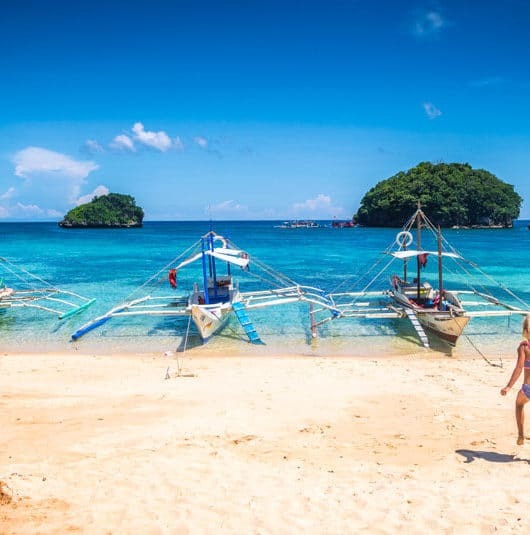 The island is famous because it once was the exile of Napoleon but more than that it is great because of its amazing turquoise waters and cute villages. Elba really has famous beaches. The most famous one is Capo Bianco because of it’s clear water that is perfect for snorkeling. But every beach on the island really are super cute and have something charming on their own. For aperitivo don’t miss the cute towns of Capoliveri and Porto Azuro! What I liked the most about Elba is it’s laid back atmosphere. Perfect for a relaxing holiday with kids (or not)! Tuscany‘s Etruscan Coast boasts the beautiful rolling hills, vineyards, olive groves, and charming villages that you probably associate with Tuscany. But the sunny, sandy beaches and ocean vistas make it even more spectacular. Though vacationers flock to the beach towns for the summer sun, and bicycle tours cycle through on a regular basis, the area still feels relatively undiscovered and uncrowded. Not everyone knows that this area is also home to world-class wineries like Sassicaia. From the town of Bolgheri heading toward Castagneto, a road lined with cypress trees has been declared a national monument and continues through olive groves and fertile vineyards. This Wine and Olive Road is the perfect place to do a few tastings and admire the scenery. Whether you prefer easy bike rides to the beach or hopping from town to town, walking to the village gelato shop or tasting wines and olive oils, there’s something for everyone in this beautiful Italian countryside. They are everywhere, on the streets, locked up on racks, lean up on walls, in backyards —— they are just all over the place. Bicycles that is. Cars may not enter the old town Ferrara so everyone uses bikes for their shopping, for their commute, for their recreation and well just about everything. There are 50+ miles of cycle paths and over 100,000 bicycles for about 130,000 people. One of the best bike rides in the City of Bicycles is the 5.5-mile route along the wall that encompasses the historical old city. 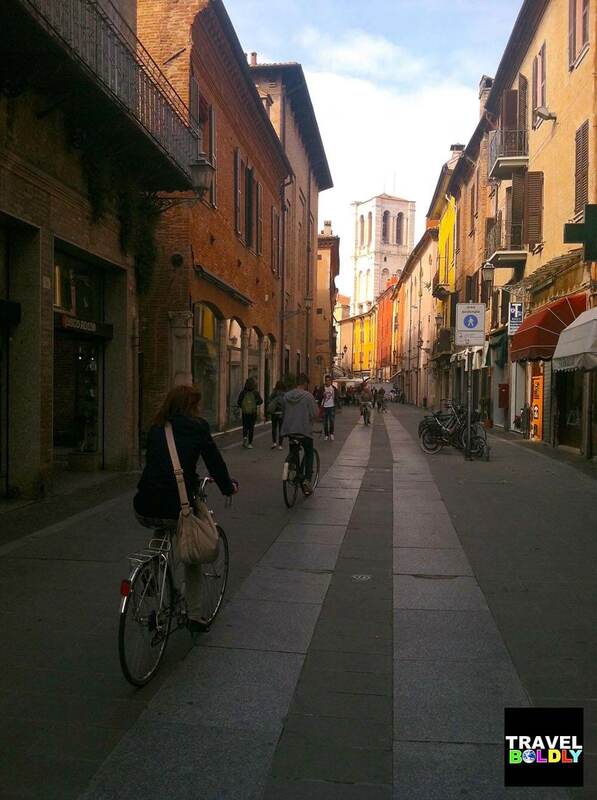 These walls defended the city in ancient times and now form the demarcation for the bicycles only area of Ferrara. Visit the Botanical Gardens with 1300 plant species in the greenhouses and 700 species in the outdoor gardens. After the gardens stop by the nearby Pasticceria Naturale for a coffee and pastry. Tour of Castle Estense located in the center of old town. Also known as the Castle of Saint Michael, it was built in the 14th Century and is an impressive example of medieval architecture. This photogenic castle sits on an island surrounded by a moat. See Ferrara from the water. Take a boat trip on the longest river in Italy, the River Po. Canals link Ferrara to the River Po. The boats leave from the southern edge of the city. Fiesole is a little town in the hills above Florence. During the time of the Medicis, it was a retreat from the city, a place to get away from it all. Fiesole still feels like a bit of a getaway from the business of Florence, though it is just a short bus ride or drive away. We took a 2.5 km loop walk on our trip to Fiesole. 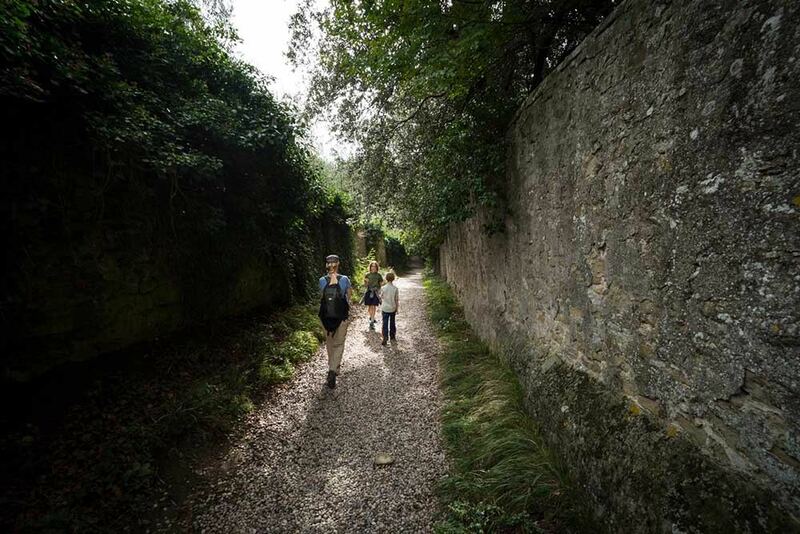 This day hike near Florence wanders through the butter-colored town, past the hill where Leonardo Da Vinci did his human-powered flying experiments, and alongside several stone quarries. After walking the loop, there is still more to explore in Fiesole. Visit the chapel and museum at the Monastery of San Francesco and drool over the art at the Bandini Museum. Entrance to the Bandini also allows you access to the Civic Archeology Museum and the 2nd Century BC amphitheater. Finish the day with a leisurely late lunch and a glass of wine at Il Fiesolano. Known the world over as the birthplace of the Renaissance, Florence is an absolute must for any first-time traveler to Italy. Between the huge wealth of artistic and historical attractions as well as the fantastic day trips you can take in the region, you can easily spend a week in Florence and do every day something different. 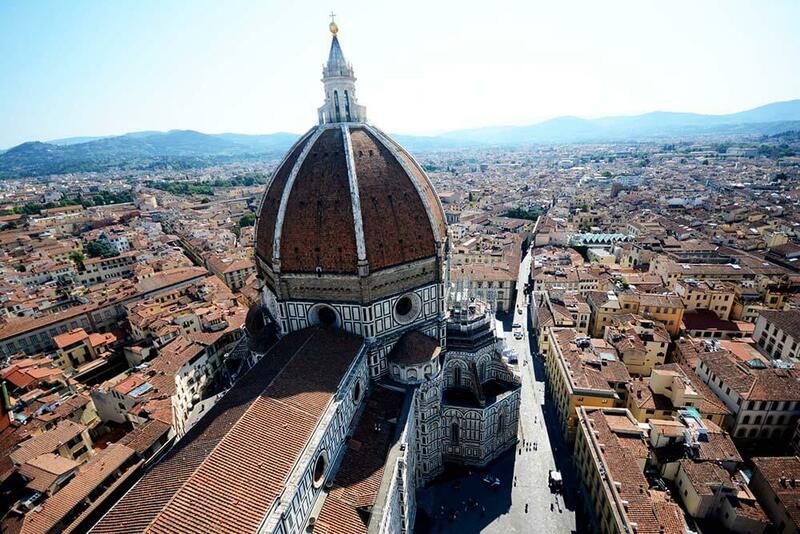 Some of the places you can’t miss in Florence if it’s your first trip are the complex of Santa Maria del Fiore Cathedral, Baptistery and Bell Tower, San Lorenzo Basilica and the nearby mausoleum of the Medici family, Santa Maria Novella Basilica and cloister, the gorgeous Uffizi art gallery, Palazzo Pitti and the Boboli Gardens, and the important Palazzo Vecchio. Florence is home to the best museums in Italy, and honestly, in the world, where you can see famous works of art such as Michaelangelo’s David and much much more! For a great day trip, some of the best places to visit from Florence are the medieval towns of Siena and Lucca and Pisa, most famous for its Leaning Tower. Florence is one of the most major cities in Italy and very popular with tourists, but still definitely worth visiting in your lifetime. I left my native Italy ten years ago. I know well that thousands love my country to death, but the reason why I moved to Penang in Malaysia — a place that can possibly contend and even win over Italy when coming to food is purely related to the hardships of working in Italia. But there is one place that is constantly on my mind, and I must return to each time I visit home. It’s the less visited Garfagnana, the mountainous northwestern spike of Tuscany. Closer to the Cinque Terre in Liguria than Florence, Garfagnana is blessed by the fresh climate and the breath-taking scenery of the Appennini, and largely remains off the tourist radar. You would barely find another foreigner when browsing the streets of Piazza al Serchio, Garfagnana’s main village and railway link. Pisa, with its tower and tourists, is just about an hour away — but in Garfagnana, especially if you decide to hike up to the Passo dell’Orecchiella through a national park, you’ll see more wild deer and mushrooms than fellow foreign travelers. Go visit before it’s too late. Having traveled to Italy several times and falling in love with this country, we began a search to purchase a second home in Italy. We love the Italian lakes and our exploring led us to the 4th largest lake in Italy, Lago d’Iseo. One and half hours from Milan and two and half hours from Venice, the location is perfect. Some may remember when the Floating Piers were located here. Our experience of seeing Lago d’Iseo for the first time was love at first sight. 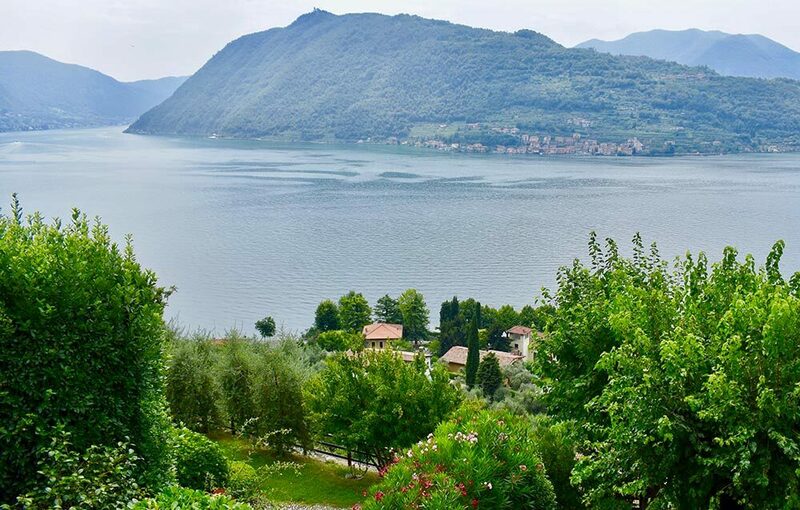 Not as touristy as the other lakes, surrounded by the Franciacorta wine region and with views that are spectacular! In the middle of the lake sits an island called Mont Isola, Europe’s largest lake island. Mont Isola is only accessible by boat but filled with fun villages to explore. Lago d’Iseo has relaxing restaurants and shopping that surround the island in several different villages. The drive around the entire lake is fun with winding roads and tunnels through mountains. 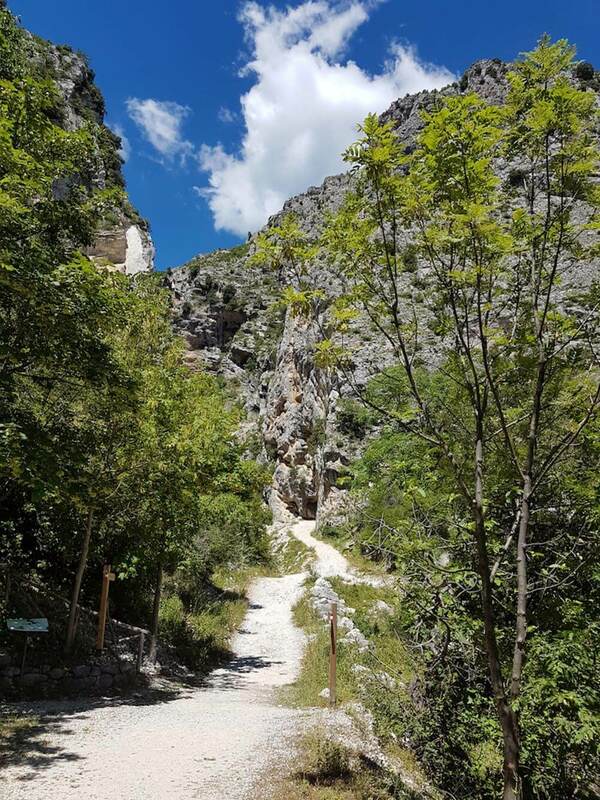 Hikers will love the challenge of hiking by using the old Roman pathway and seeing magnificent views. Lago d’ Iseo is often referred to as the pearl of Italy and we discovered and love its beauty. 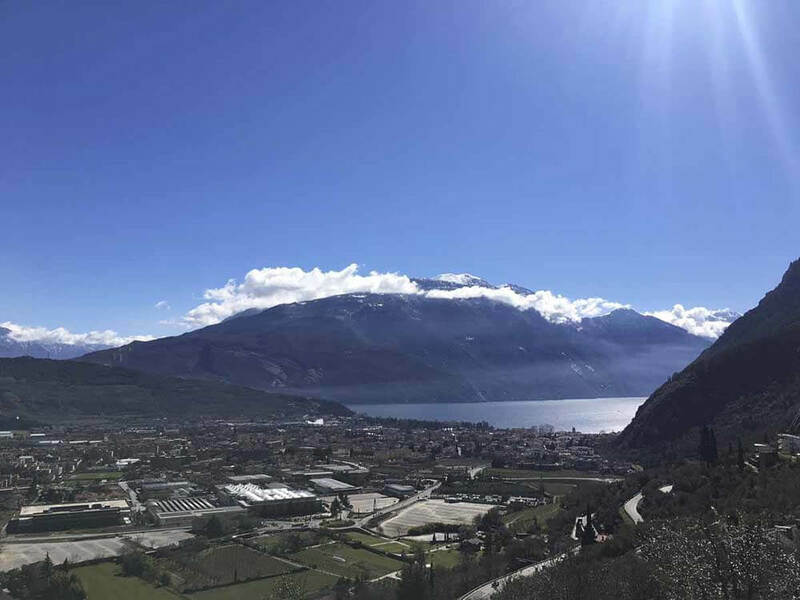 A road trip through the Italian lake district is a must-have experience in Italy, but not all people visit Lago Maggiore, the smallest of the three main lakes. On Lago Maggiore, you can find some really charming towns to wander like Stresa and Cannobio, but the crowning glory is the Borromean Islands. They are a group of islands near Stresa owned by the Borromeo family since the 16th century. On two of them, you can find beautiful historic palaces and gardens which are the Islands’ main attractions. You can get to the islands by ferry from Stresa, and you’ll need the whole day to explore all of them comfortably. Truth be told, Lake Como in Italy is one of the prettiest travel destinations in the world and one of the best places in Italy. It is one of the most picturesque lakes in Italy and is surrounded by lush green gardens, opulent villas, and sleepy little villages. No doubt, Como has been a favorite haunt among celebrities of the world. An idyllic atmosphere, gorgeous views, and delicious food and wine make the place a heaven on earth. 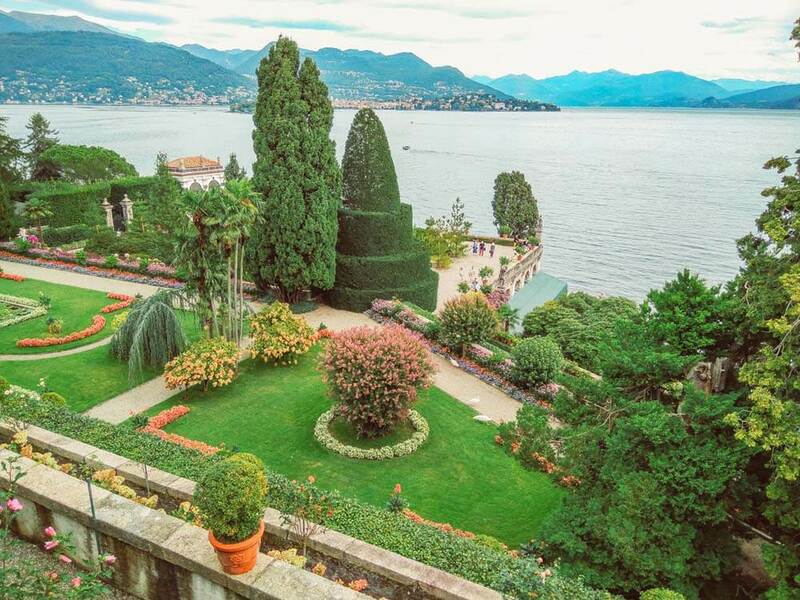 Lake Como’s legendary villas such as the Villa del Balbianello and Villa Carlotta also provide tourists with an exceptional opportunity to step into the rich history of medieval Italy. The lake has been a popular tourist destination ever since the time of Romans and continues to evoke the same emotions today. 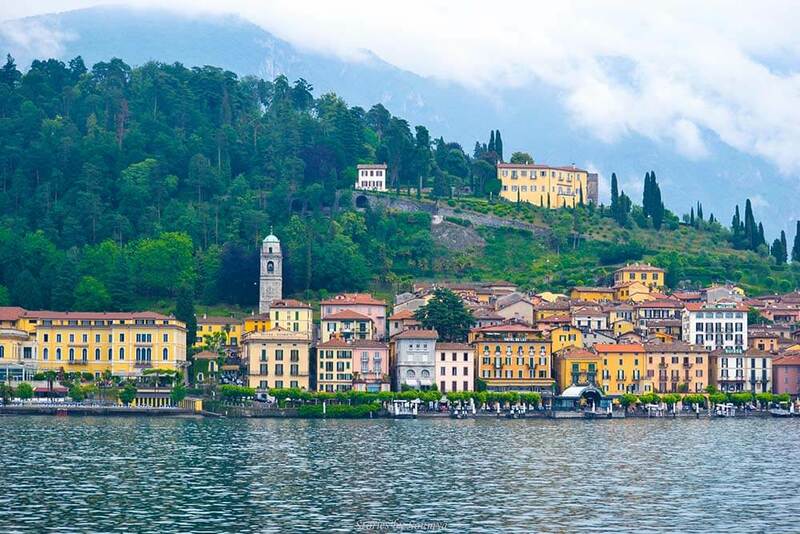 A sip of limoncello, a backdrop of mist-covered mountains, and luxury villas glistening with Italian history – the appealing combination that defines Lake Como. Lake Garda definitely deserves to be on everyone’s Italy list. It’s the largest lake in the country, and (in my opinion) the most beautiful of all Italian lakes. There are so many things to do around Lake Garda, and the lake changes so much from North to South that it is worth visiting more than once. For example, the southern part of the lake is hilly and has a Mediterranean atmosphere, making it perfect for holidays dedicated to relax, food, and wine. Bardolino is an excellent choice for wine tasting, Sirmione and Peschiera have beautiful castles and scenery, while Lazise should be the destination of choice for all those that want to relax, thanks to its thermal waters. Yet, my favorite part of Lake Garda is the north, where the lake meets the Alps and you can enjoy great adventures like hiking, mountain biking, sailing, and windsurfing. Places like Riva del Garda and Torbole are ideal for adventure lovers, and provide the ideal base to explore more of the surrounding Alps. 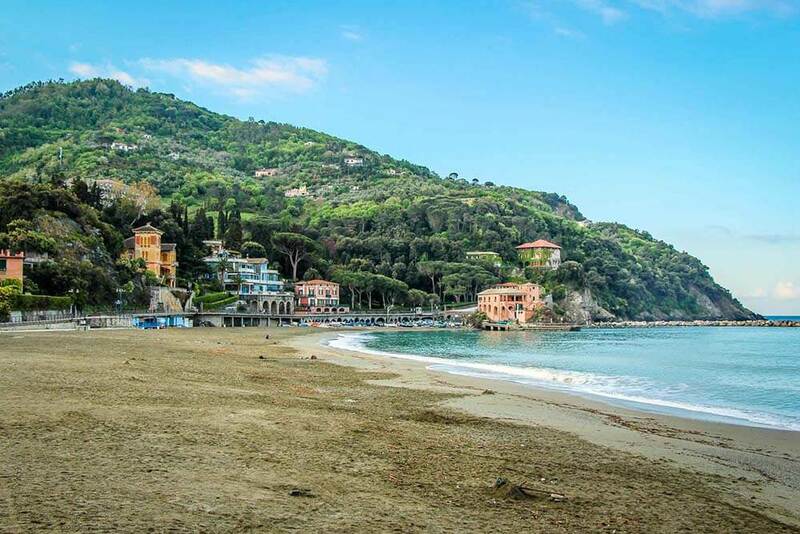 Levanto, Italy is in the province of La Spezia and though not technically part of Cinque Terre, it’s a very short train ride away from Monterosso al Mare. Levanto has everything you might be looking for when visiting Cinque Terre, incredible views, a long sandy beach, and hiking. There is one thing that makes Levanto unique from the other villages of Cinque Terre and that’s the old rail line that’s been converted to a paved pathway for walking or biking. This fun biking path from Levanto to Framura passes through several tunnels and offers some stunning views. The path is flat and not that long, but with sea views and towns to explore along the way, you can make it a full day outing. If you have extra time, hike the trail back from Levanto to Monterosso, which is also quieter than some of the more popular hiking trails in the area. It’s worth spending an extra day in the area to explore Levanto, if only for the lesser crowds! This coastal city is a hidden gem on Italy’s northwest Tuscan coast. Only 30 minutes southwest of Pisa, Livorno’s “small Venice” feel has charming mini canals off the Via della Venezia bridge, which helps to get acquainted with the hustle and bustle one of Italy’s busiest ports. Visit the 500-year-old Fortezza Nuova to see how Italy fortified its coastal city or stroll toward the Mercato Centrale, a bustling marketplace filled with hundreds of stalls. A walk to the beautiful Terrazza Mascagni, a masterpiece of architectural glory that looks out into the sea, creates a sense of peace and reinforces the beauty this small city has to offer. If the weather isn’t up to par, a visit to the Acquario di Livorno is a great way to spend quality time with the family while experiencing a reconstructed Mediterranean Sea environment that showcases the creatures inhabiting the local sea. And no visit to Livorno is complete without a taste of the local seafood. If you have never experienced Italy’s seafood or Tuscan entrees, Livorno’s food selection will excite even the most critical foodie. 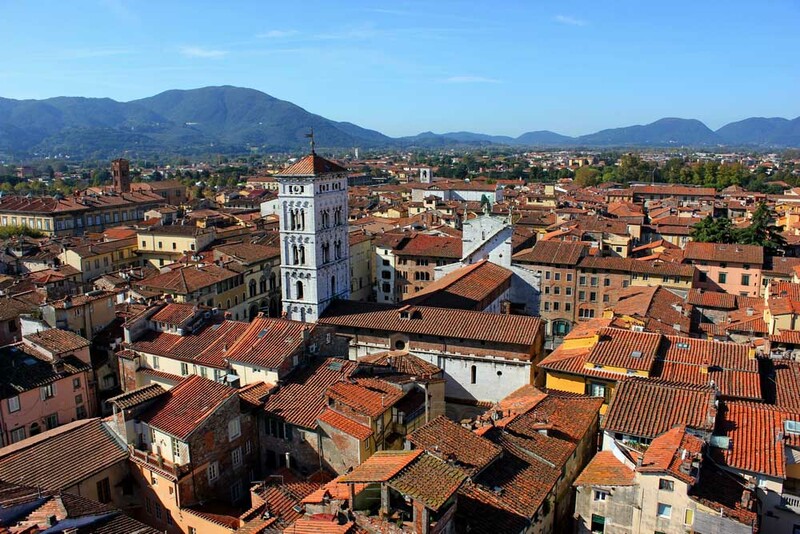 Lucca is a small city in Tuscany not far north of Pisa and easily accessible from Florence, making it a great addition to any Italy itinerary. It is one of the best cities to visit in Italy if you want to experience a Medieval city. It is one of the few cities left in the world with intact medieval city walls. The old town is a short walk from the train station, and as you pass through the walls, you find a vibrant city with a cathedral from the 1100s, winding streets, and not one but two towers worth climbing. The Ore Tower gives a great view of town including the second tower, Tower Guinigi, which has trees growing at the top. The walls themselves are quite wide and grassy on top offering a nice place to run, ride a bike, or just sit to the sun. A handful of museums, churches, plenty of restaurants, and a medieval plaza built over the Roman amphitheater mean there is something here for any interest. Lucca is certainly known by the tourist trail, but in fall when we visited it wasn’t overly crowded and yet still had nice weather. Definitely worth a visit in any season, Lucca is also the host to a large Comic convention in November. Majella National Park is located in the heart of Italy and one of the popular things to do in Abruzzo region. The Majella National park is a great destination for hiking, camping and just about anything to enjoy nature. It is one of the most visited attractions close to Rome for nature lovers. Due to its altitude, it is a famous ski destination in Italy and when summer comes, the flora and fauna of the national park are blooming. 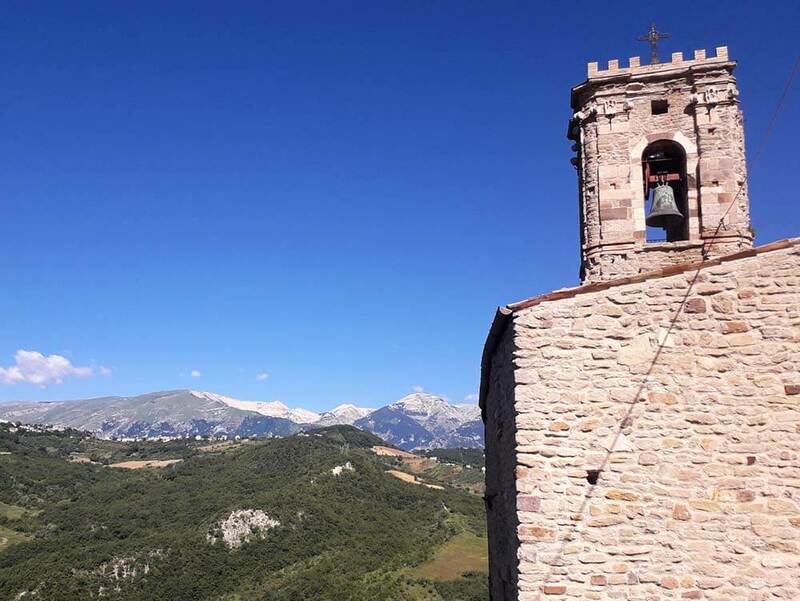 Making this area of Abruzzo worth visiting and a great day trip destination from Rome. Maratea is a relatively unknown gem in Italy‘s Basilicata region. The town sits above a gorgeous stretch of Italian coastline and is known as the Pearl of the Tyrrhenian. 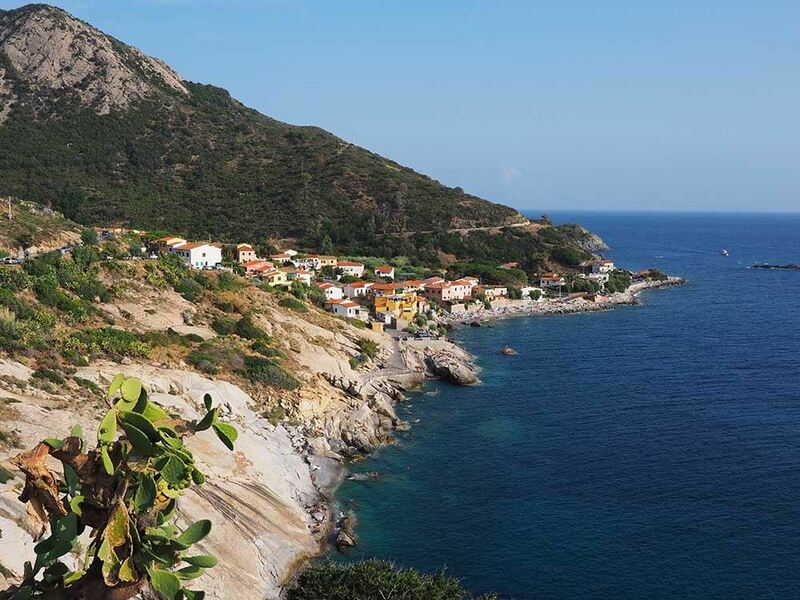 With few transportation links, Maratea’s beaches aren’t crowded even in the midst of summer. And with plenty of sea caves dotting the coast, you can easily even find a romantic hideaway perfect just for two. This part of the country isn’t very developed making it one of the best places to vacation in Italy. And as you’d expect with Italy, the food in the Basilicata region is excellent too. Expect lots of fresh fish and seafood from the Tyrrhenian, rustic dishes and a lot more spiciness thanks to Arabic, Spanish and even French influences from Maratea’s colorful history. Marettimo is a tiny island off the coast of Sicily, and one of Italy’s absolute hidden getaways. Only a few tourists get to the island, however, it offers something for everyone. On the island, you can discover ancient Roman ruins, chill on the beach or explore the many hiking trails. There are a few diving operators offering excellent snorkeling and scuba diving around the island. The operators also offer boat trips around the island for those who don’t want to dive. The little amount of tourists makes it easier to get in touch with the locals and learn more about their culture and customs. 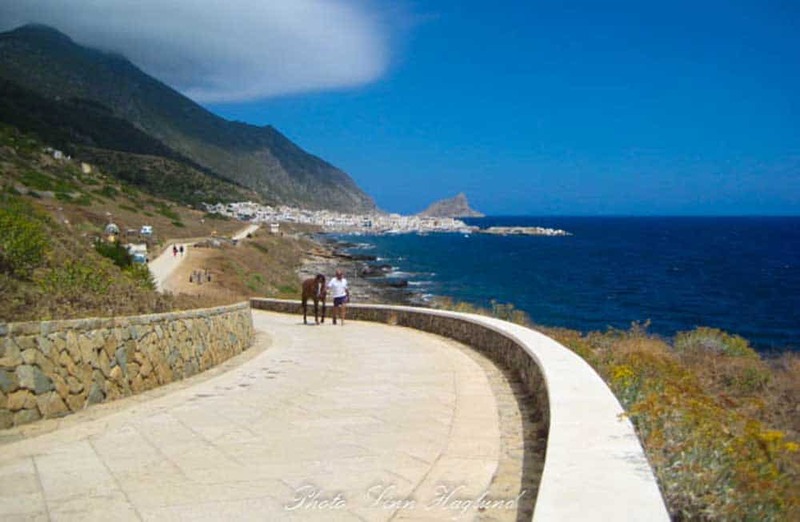 You can easily get to Marettimo by boat from Trapani in Sicily, and the ride only takes about an hour. Matera is one of Southern Italy’s most sublime and primeval-looking places. 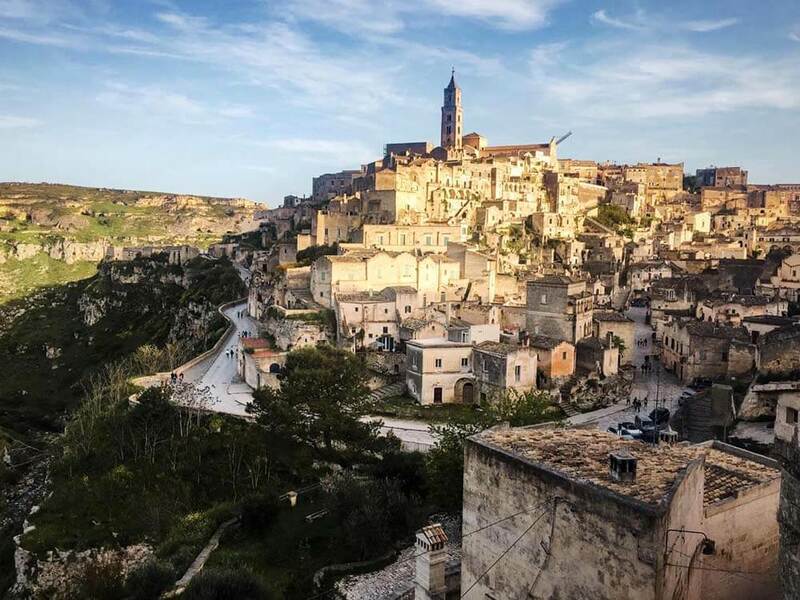 It’s most celebrated for its ancient town of cave dwellings, known as the Sassi. In 1993, the Sassi districts were designated a UNESCO World Heritage Site for being “the most outstanding, intact example of a troglodyte settlement in the Mediterranean region” Today, many of the ancient cave dwellings have been regenerated and are currently occupied by booming businesses, hotels, and restaurants. During your visit, you can dine, shop and sleep in caves. You’ve probably seen Matera without knowing it, as it’s is a favorite destination among Hollywood filmmakers. Scenes from Wonder Woman (2017), The Passion of the Christ (2004), and The Nativity Story (2006) were filmed in this ancient city. I highly recommend staying at least 2 nights here. As you plan your Italy trip, consider exploring the coastal region of Puglia, before heading inland to Matera. The hilltop city of Matera in Basilicata, Southern Italy, is the most extraordinary place we’ve ever visited. It’s one of the oldest cities in the world and virtually all the buildings are in caves first lived in 9,000 years ago. You’ll feel as if you’re on a film set as you walk down its narrow lanes and into its underground tunnels. Matera looks so much like the Jerusalem of Biblical times that it’s been used in countless films. Every day in Matera is an adventure. There aren’t that many places in the world where you really feel as if you’ve been transported back in time. It’s no surprise that Matera has been named as a European Capital of Culture for 2019. Kids will love exploring here – especially when they find out that they can stay in one of the amazing cave hotels. It’s such fun wandering around the massive underground caverns and seeing the unique cave churches. Matera is still relatively unknown to foreign tourists which gives it all the more charm. It has that delightfully laidback feel of a small Italian town. Go now before everyone finds out about it. With so many incredible historical sights and places in Italy, Milan is often overlooked as a more “modern” city lacking any well-known historical attractions. However, I enjoyed my stay a lot and Milan quickly became one of my favorite European cities. 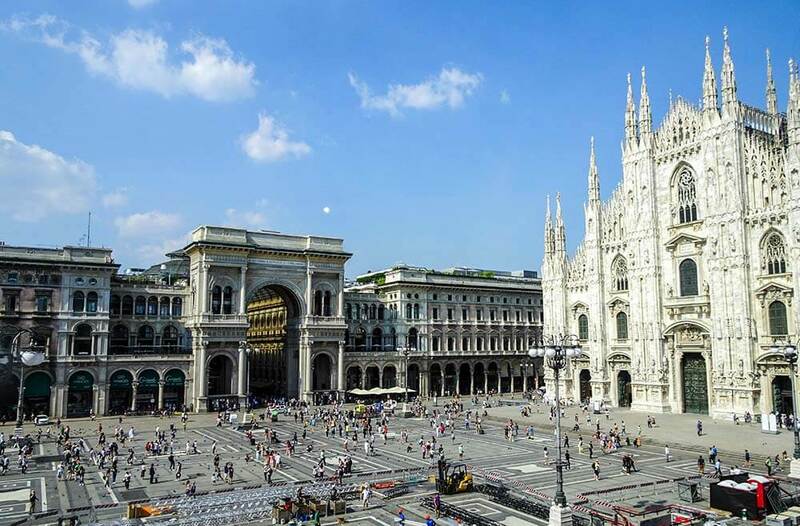 If you’re looking for a place to enjoy the “Dolce Vita” for a few days, full of good Italian food, coffee, and fun nightlife, Milan is the place to be. There are many beautiful spots around the city, such as the canals around Navigli which are perfect for an Aperitivo or a pizza for sunset. Of course, you also shouldn’t miss Milan’s main attraction, the stunning Duomo cathedral. I highly recommend going on the roof of the Duomo, where you can see its incredible architecture and enjoy the beautiful view. If you have an extra day in Milan and want to escape the city for a bit, you could do a day trip to Lake Como, easily reachable by train. One of my best Italy travel tips is not to skip over Milan! Modica is one of a cluster of Baroque cities in the southeast of Sicily. 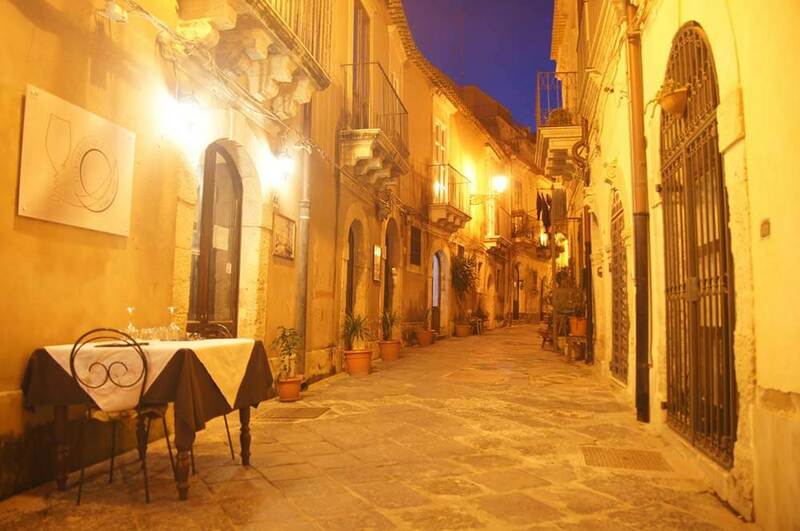 Along with Ragusa and Scicli, it was rebuilt after an earthquake hit the region at the end of the 17th century. Modica is set in a gorge with narrow lanes winding their way up the steep slopes on either side of the valley floor. It’s worth the hike to the top to take in the views over the surviving medieval stone houses punctuated by majestic Baroque buildings. If I was going to shoot a movie full of drama, I’d set the opening scenes on the steps of Duomo di San Giorgio. 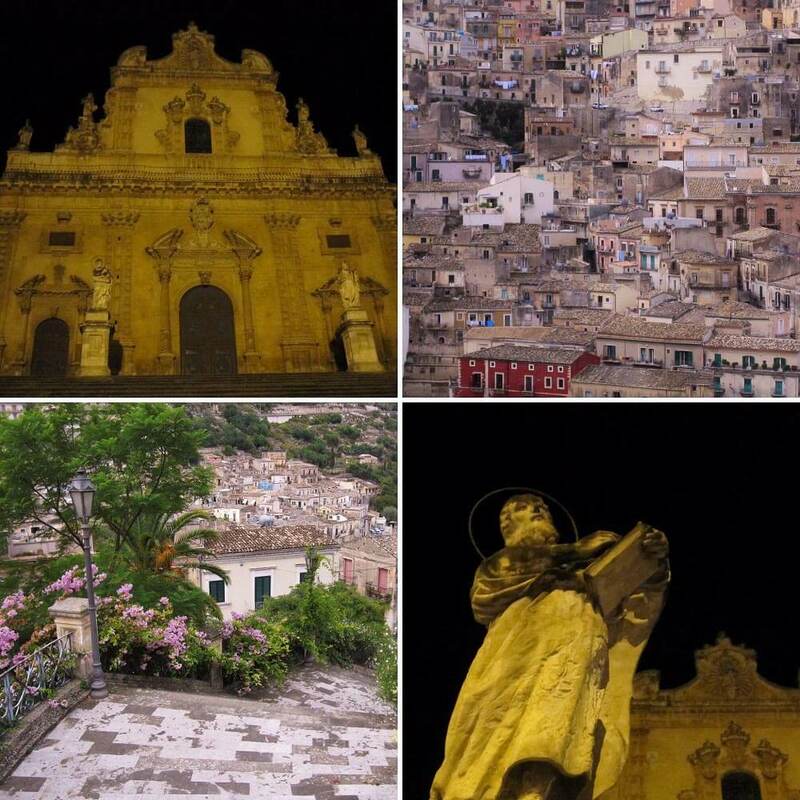 I first visited Modica during an evening rainstorm when the Duomo was lit up against the dark narrow streets surrounding it. By day, of course, Modica is charming. When I visited the city several years later with my family we enjoyed lunch at the famous Osteria dei Sapori Perduti (meaning “lost flavors”) where the menu includes ancient recipes next to the list of dishes. We visited the city’s oldest chocolate shop, Antica Dolceria Bonajuto, for a kitchen tour and a history lesson on how Modica’s chocolate gained its unique (but delicious) grainy texture. 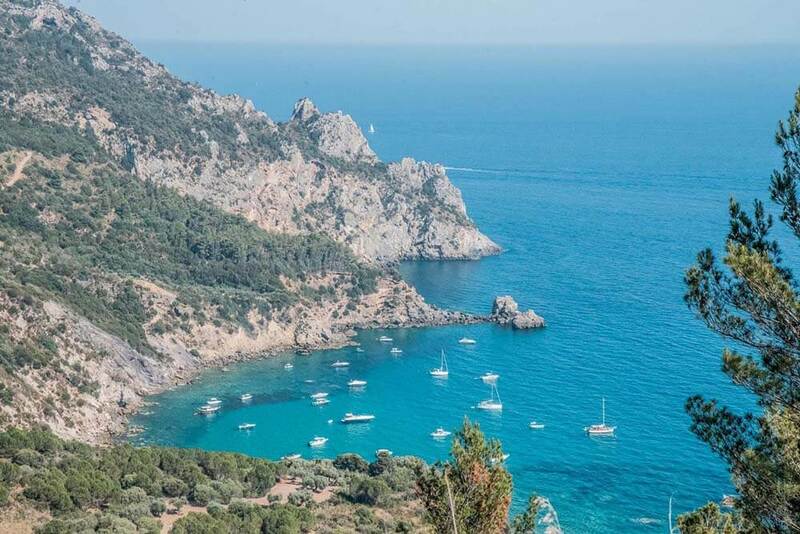 Located just a scenic 90-minute drive north of Rome is this absolutely stunning comune called Monte Argentario. It’s basically a little island off the coast of Tuscany, and is one of the most idyllic and best places to visit in Italy! My cousin has been living there for over 12 years now, and every time I visit her I fall in love with it more and more! While there are a couple major places to visit on the island, I’d recommend staying in the charming town of Porto Ercole. Just make sure you rent a car and drive around the entire island along the Via Panoramica Road! It’s such a remarkable experience, and you’ll be blessed with jaw-dropping views, lovely wineries, and stunning beaches. It’s actually known to Italians as being where the rich Romans vacation, but can also be a fine budget travel destination as well! It may not be a famous place in Italy, but it’s my favorite hidden gem in the country! Buon viaggia!! 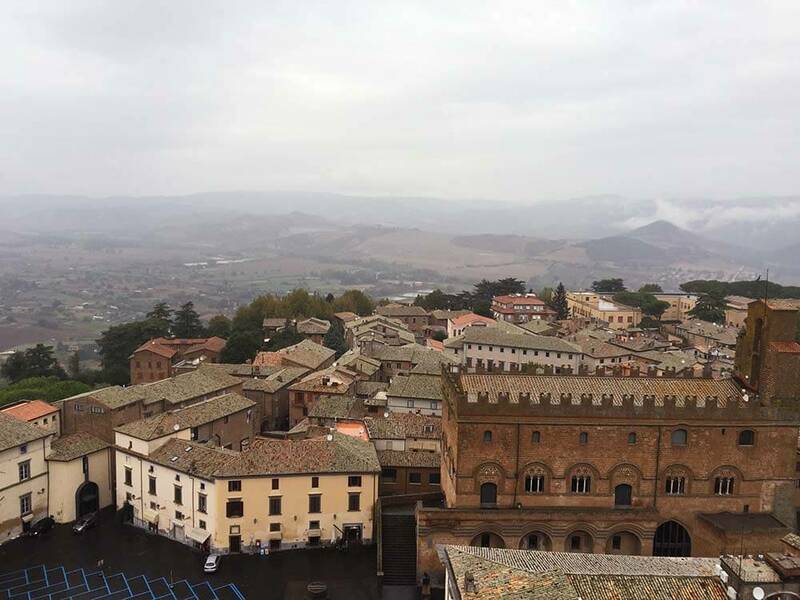 If you’re looking for a stunning hill town to visit in Italy, consider Orvieto. This charming Umbrian hill town is just an hour away from Rome by train, so you can explore Orvieto in just one day! Orvieto’s location, on the top of a big volcanic rock, affords awesome views over the surrounding countryside. For even better views, climb to the top of the Clock Tower in the center of town. And Orvieto’s magnificent Duomo is a must visit. With a surprisingly glitzy and ornate façade for a small town, Orvieto’s Duomo is also known for Luca Signorelli’s amazing frescoes inside. Wandering Orvieto’s charming streets is a pleasure, as is browsing the numerous ceramics shops all over town. And to get a glimpse of life in Orvieto’s vast underground, join a guided tour and learn about its Etruscan past. If that is not enough, go down into the depths of St. Patrick’s well, an engineering marvel that will leave you awe-struck. With its amazing sights and charming small town vibe, Orvieto makes for a memorable addition to your itinerary for Italy! Padua (Padova in Italian) is one of the most underrated cities in Italy. 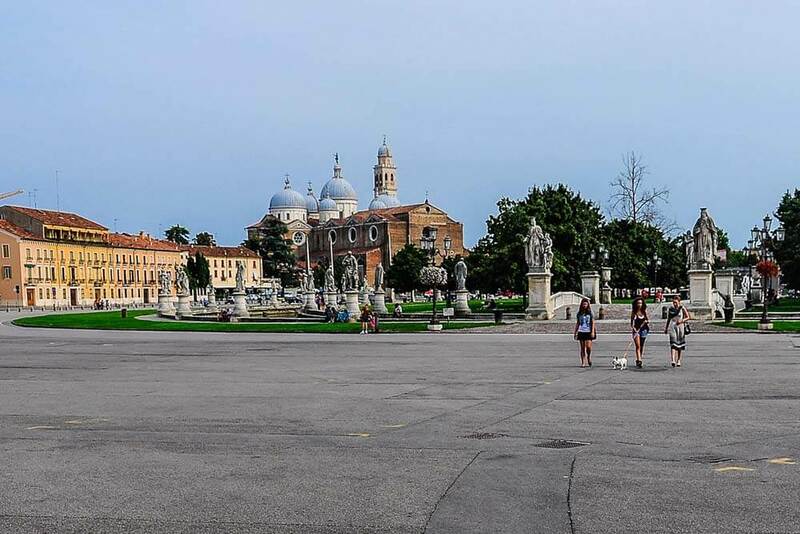 Due to the proximity of Venice, most people focus on the famous city in the lagoon, but Padua should deserve much more attention from travelers. Padua is probably most famous for its religious heritage, being the town of Saint Anthony. In addition, this city also played a key role in the cultural history of Italy having one the oldest and most prestigious universities in Europe. The most important things to visit in Padua are the Basilica of Saint Anthony of Padua and the Scrovegni Chapel with fascinating frescoes from Giotto in its interior. 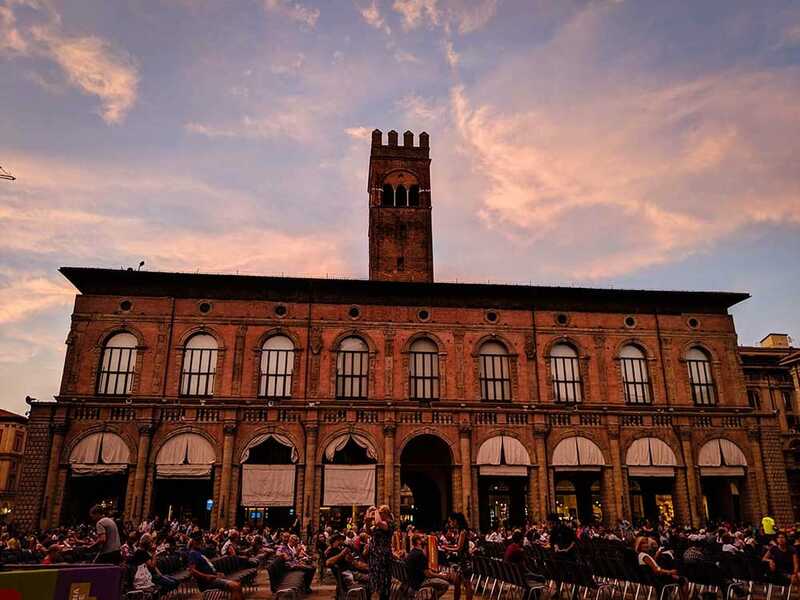 Padua is also a city of beautiful squares: Prato del Valle, with its lovely canals and statues, is actually one of the largest squares in Europe. If you are in Padua, you can’t miss out on some of the old-school coffee places, and in Café Pedrocchi you can drink espresso in one of the most antique cafés in Italy. 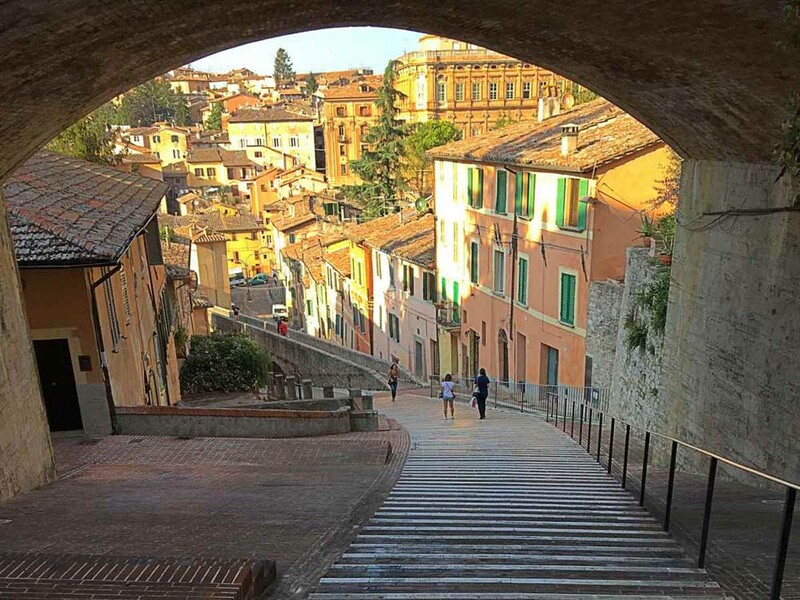 Perugia is a classic Umbrian medieval hill town, complete with a long flat pedestrian street Corso Vannucci, which makes Perugia one of the best places in all of Italy to experience a passeggiata (evening stroll). 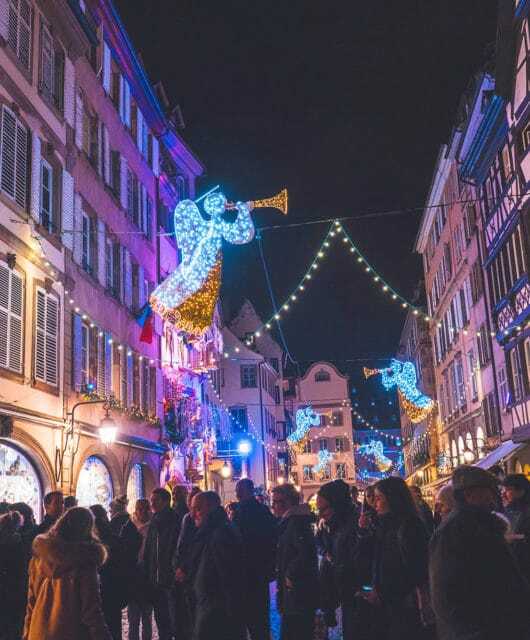 Grab a gelato or down an espresso, then join the locals for a leisurely stroll up and down the street, taking in the sights, enjoying buskers singing and playing music, and watching everyone else do the same thing. Then head to one of the many restaurants for classic local pasta and truffles or Umbrian sausages with torta al testo (Umbrian flatbread). For dessert, try some Perugina chocolates – they come from Perugia, so what better place to eat them. Historic Perugia is beautiful, with steep, narrow cobbled streets; a large Etruscan gate; and the. The main square Piazza IV Novembre has the gothic Cattedrale de San Lorenzo and the Fontana Maggiore, a beautiful fountain. Nearby is Via Appia, a narrow street that actually goes along the top of a raised aqueduct, cutting right through a local neighborhood. Don’t miss seeing the Etruscan stone cistern discovered underneath a palazzo in town. If you’re looking for a quaint and beautiful Tuscan town where you can relax for a few days, Pienza would be an excellent pick. The historical center is a UNESCO World Heritage Site, and for good reason – it was built as an ideal Renaissance city and is immaculately preserved. It’s small enough that even little legs will have no problem traversing the town center but big enough that you’ll find some charming hotels and Airbnbs. It has breathtaking vistas and stunning architecture – not to mention a long-standing history of Pecorino cheese-making! The ruins of Pompeii have fascinated me since I learned about them in high school, so visiting the archaeological site was a must-do on my trip to Italy. Visitors can explore the massive park via a guided tour or on their own and can easily spend a whole day at the site. 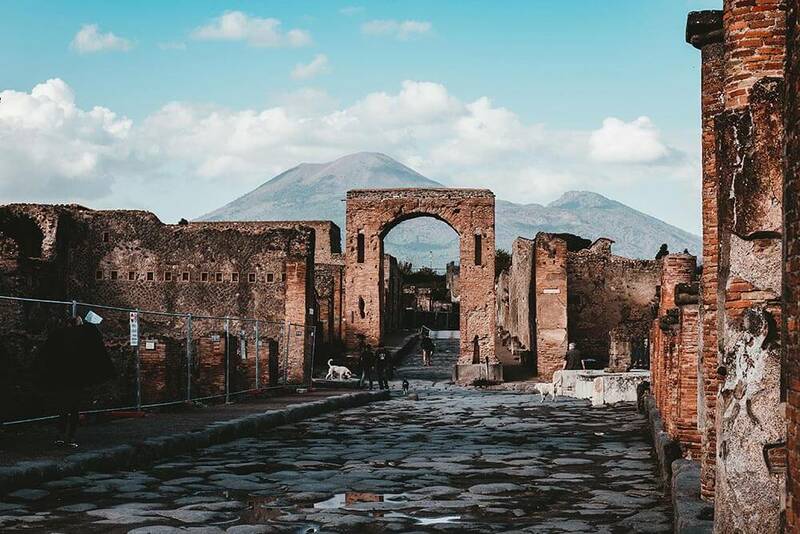 Some of the top things to do in Pompeii include visiting sites like the amphitheater (which can still host performances), Temple of Jupiter, Forum, Basilica, and many private residences. Though most of the famed frescoes and other artifacts have been relocated to museums, some originals remain and others have been recreated. You can also view the heart-breaking plaster casts that were made of the people buried in the ash who left human-shaped voids as their bodies decomposed. The ruins can be reached via train from Naples and make a perfect day trip whether you’re staying in the city or just stopping in the cruise port. When I think about a mountain resort in Italy, immediately the name of Ponte di Legno comes to my mind. This is where I learned how to snowboard and where I fell many times on its white covered slopes. I loved to spend my winter there when I lived in Italy and I felt so lucky that my parents bought a small cabin in the small town so that I could go all the time I wanted to. Its variety of ski slopes makes everybody happy, from kids on their first attempt, to expert skiers. And, most important, there is almost always snow even when it’s not snowing. But you cannot ignore the spectacular hikes you can do during the summer. 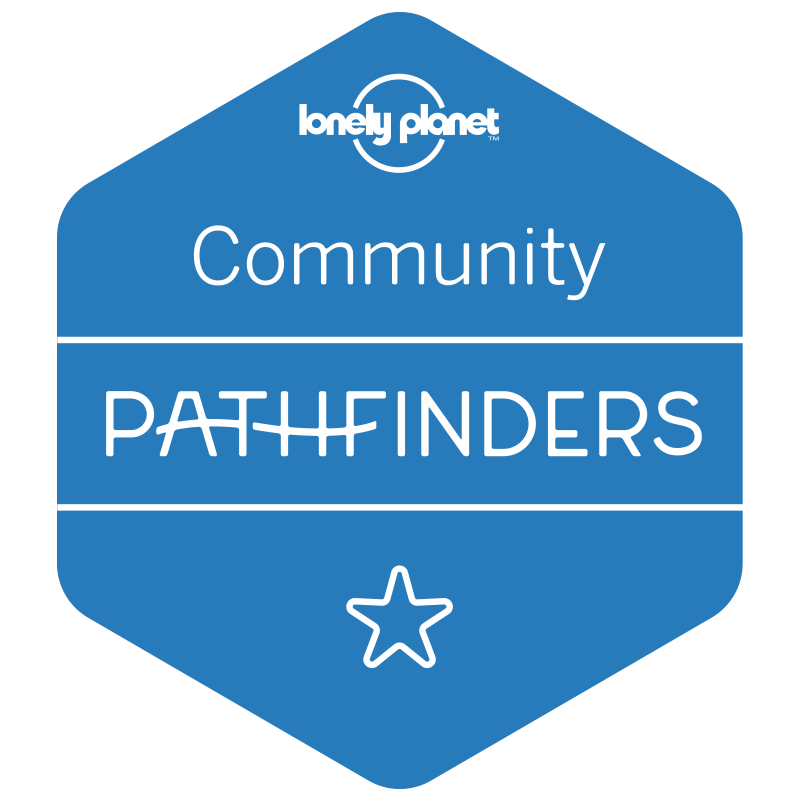 Amazing and well-marked trails will take you to explore the entire mountain range and you can go on forever and sleep in the free mountain shack that are scattered around the peaks and well equipped and taken care of by the local mountain associations. The little town of Ponte di Legno is also a gem, for an evening stroll, rich in local restaurants where you can try the regional specialties or browse around the fancy clothing shops. It’s definitely a complete destination that makes everybody happy whether you are a lover of outdoor activities or you just want to enjoy the views and the culinary scene. As the main protagonist of southern Italy‘s lemon-scented Amalfi Coast, Positano is the epitome of ‘la dolce vita’. This tangle of pastel-hued facades tumbles down a near-vertical cliffside, colliding with an aquamarine sea and soul-stirring scenes the good life. Families flutter from pizzerias to gelato stands, while couples sip Prosecco and twirl seafood pasta onto their forks on restaurant terraces draped in blushing canopies of wisteria. Take a stroll and explore the little delis, cafes and gift stores or hop on a boat and bounce across the bay to the Isle of Capri. And whatever you do, don’t leave without tipping back a few glasses of limoncello, an uplifting liqueur made with the area’s emblematic lemons. This really is the good life. Living in Amsterdam, I keep forgetting how much natural beauty can be found only a few hours away from my hometown. There is still a lot of Italy for me to explore; this time I decided to visit the northeast part of the country, also known as the Dolomites. I was transported to a “Sound of Music”-like landscape, with crisp mountains and 50 shades of ochre. Traveling in November is great if you would like to avoid the tourists, as it’s just after the hiking season and just before the skiing season. Even though it was quite cold in places, the sun was out, making it perfect weather for hiking. Out of the different places my girlfriend and I visited, the Prager Wildsee stood out majestically. We had the painting-like landscape practically to ourselves, partially because there had been a terrible storm just the week before we arrived, which caused a lot of canceled itineraries. 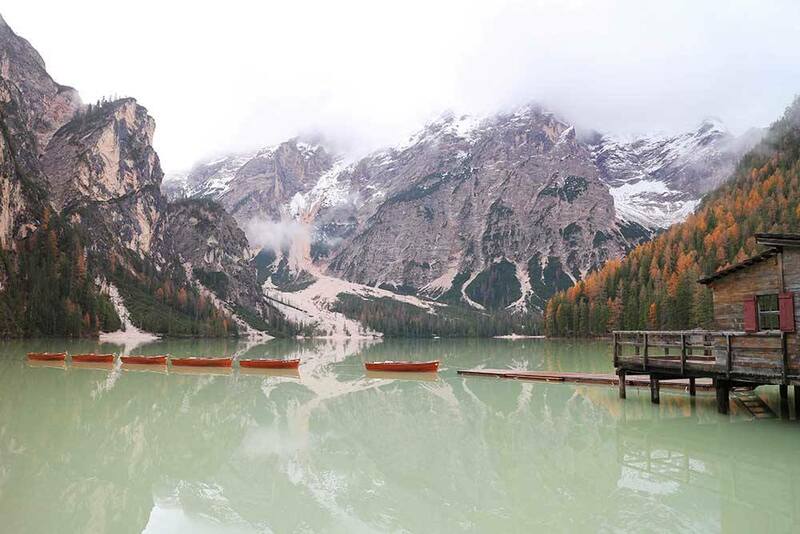 It’s a sight well worth seeing for yourself, with its cyan-colored water (which was a bit murky because of the storm), vast snow-capped mountains, wooden boats and brownish green conifers. It reminded me somewhat of the rugged nature in Alaska. I recommend following the trail around the lake to experience its ever-changing views. I can’t choose only one place in Italy as the thing I love the most about this country is how it doesn’t matter where you go, you will always find tons of beauty – and incredible food! But the place that surprised me the most on my last trip to Italy was the Island of Procida, a tiny place that remains untouched from mass tourism – a rare find in Italy! It’s like if Santorini and Burano decided to have a baby in the Gulf of Naples, so no doubt to pay a visit to this piece of heaven if you’re staying in Naples. You can go for a day trip or stay. Do not miss the sunrise from Terra Murata overlooking Marina Corricella. It’s incredibly beautiful. The little towns and villages on the Amalfi coast are heavenly. They are picture perfect gorgeous villages, perched above the turquoise blue waters of the Mediterranean. There are many stunning hikes in the steep mountains towering over the Amalfi coast. I could spend months on the Amalfi coast visiting every village and walking every hike. Ravello is one of my favorite towns ever. 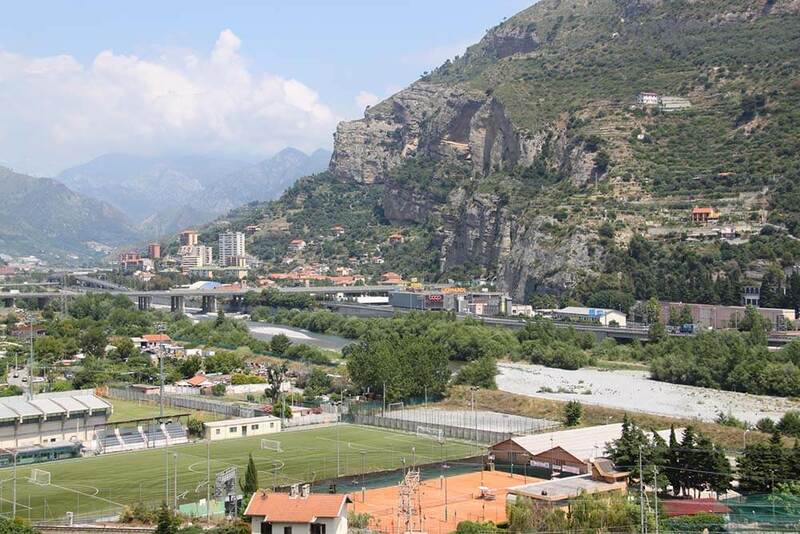 It’s located up high in the mountains further up from the coastal towns of Amalfi and Atrani. We took the local bus from Amalfi up to Ravello. On the way back we walked all the way down, through unbelievable views, lemon orchards, olive groves, and many stairs. Later we felt every strand of muscle in our legs but the walk was worth it. For a small town, Ravello has a lot of history, attractions and amazing Italian food. My favorite memory is from the visit to Villa Rufolo, one of the two famous villas in Ravello, now revived for patrons of music, arts, gardens, food, and photography. It’s beautiful buildings, towers and gardens from the 13th century was remodeled in the 19th century, making it popular for visitors around the world. It’s gardens overlooking the blue waters are probably the most photographed for its vibrant colors and perfectly manicured flower beds. But the most unique attraction in Villa Rufolo is the outdoor concert setting, with a backdrop of the Mediterranean down below. I can only imagine how gorgeous concert music would sound in this setting. Ravello is a beautiful town above the Amalfi Coast whose scenic beauty has earned its status as a UNESCO World Heritage Site. Its high vantage point means there are breathtaking views of neighboring towns and the blue sea down below. Its the perfect place to go for a slow holiday and part of the beauty of this town is simply exploring its (steep!) winding Italian passages. 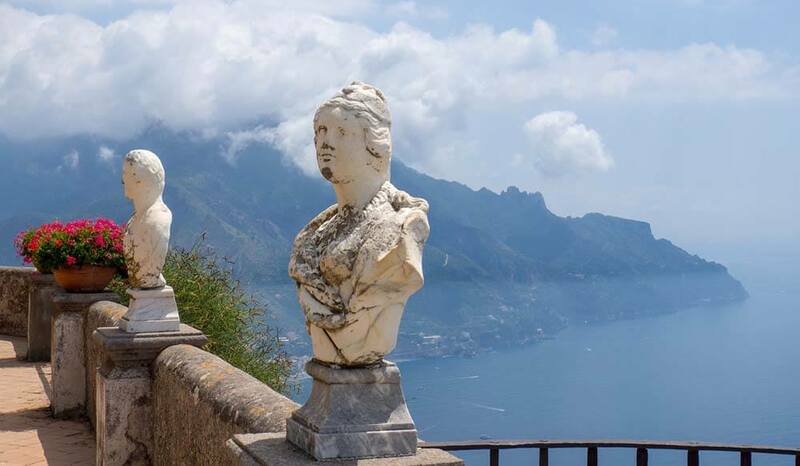 There are beautiful churches and sanctuaries to admire but the best thing to do in Ravello is to visit Villa Cimbrone, a stunning villa that dates back over one thousand years! Walking through the architecture and grounds here gives you the impression that you’ve been transported back centuries. The Terrazzo dell’lnfinito (the Terrace of Infinity) is one of the most romantic spots in Italy with pink sunsets and classic Italian architecture. It’s like nothing you’ll have ever seen before! Roccascalegna Castle is a medieval castle located 3-hour east of Rome in the region called Abruzzo. This castle holds a war history but not is one of the most popular destinations in the province of Chieti. Located at the cliff, from this castle, you can overlook the snowcapped mountain called Majelletta which is also a known ski resort. The little town of Roccascalegna is known for producing world-class wine. Many tourists are arriving in Pescara which has a direct bus and train from Rome, from here, you can take another local bus or rent a car and drive yourself around to explore the town and the vineyards surrounding the castle. From the town proper, Roccascalegna castle is only a few minutes hike, however, the steps can be very steep while the view from the top is truly magical. If you are looking for a fairytale-like experience with an outdoor adventure, here’s a place for you to explore without spending too much and having to brave a large crowd – it is definitely one of the hidden gems of Italy. There is nowhere like Rome. It is without a doubt one of the best places to go in Italy. Home to absolutely iconic world treasures (the Colosseum, the Pantheon), beautiful, awe-inspiring neighborhoods (Trastevere and Centro Storico to start), some of the world’s best pasta (bring on the carbonara), and even an entirely separate country enclosed within its borders (hello Vatican City), Rome is a world unto itself. You will literally never run out of things to do in Rome: once you work your way through all the world-renowned attractions, there is still so much to discover beneath the surface (sometimes literally). Stand among the ruins of public baths, wander through immaculately maintained gardens, take a break from pasta to devour artichokes in the Jewish Ghetto, step inside impressive catacombs, and admire world-class art, all within the truly Eternal City. The sheer breadth and depth to what Rome offers make it an unforgettable and unmissable destination not only in Italy but across the globe. Salerno Cathedral: If you only tour one historical monument in the city, make it this one. This Romanesque church features stunning, ornate architecture and plentiful religious artifacts. A bell tower sits at the rear of the cathedral, under a classic top dome. This is Medieval architectural and history at its finest. Minerva’s Garden: Nestled into Salerno’s historic district, this oasis serves as both a public park and a botanical garden. With over 200 varieties of plants, herbs, and greenery, it’s a stunning place to walk through, marked by stone archways. 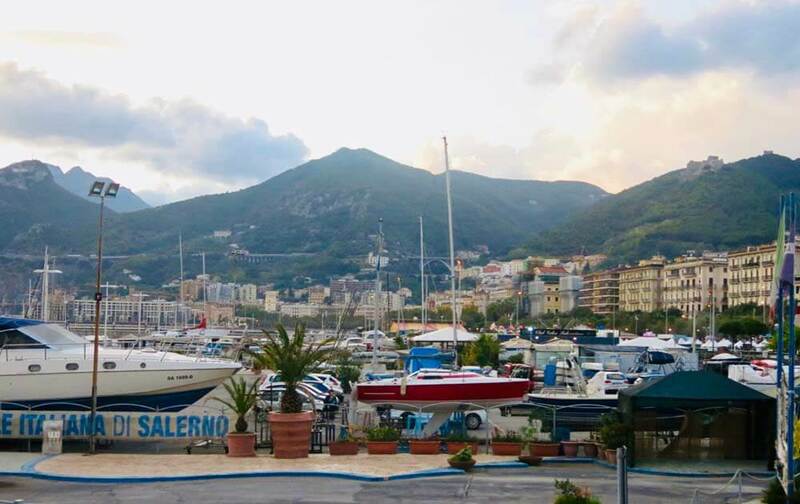 Salerno Harbor: Always bustling, the city’s main harbor is far from a tourist trap. It’s a fantastic spot to watch the port activity, where fishing boats are always coming and going. A scenic stretch of pier lets you view the cityscape in full, which makes for a breathtaking view. Forte La Carnale: A castle with strong historical roots in Salerno, this fort is perched atop a hill, meaning you can see the entire city from its highest point, as well as learn about Salerno’s military history. When you’re finished exploring, enjoy a glass of wine and classic Italian cuisine at the on-site restaurant. 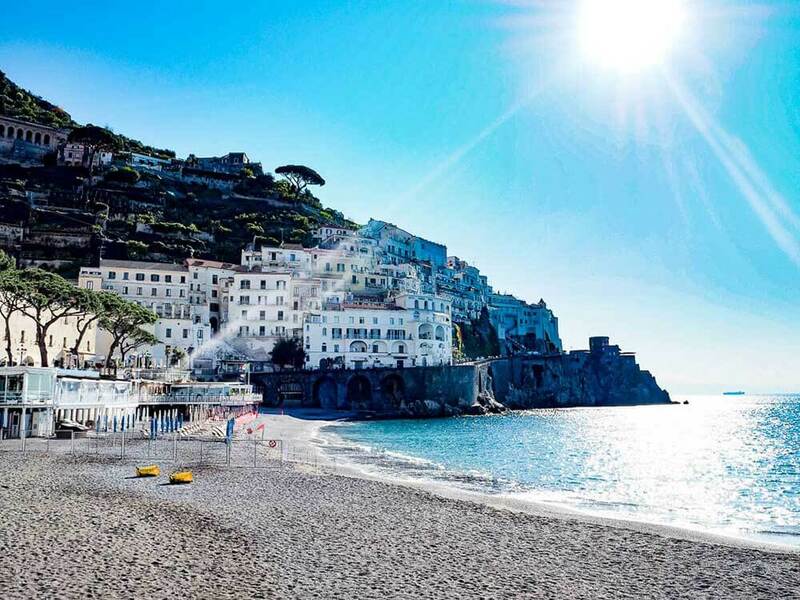 In Salerno, the rugged Mediterranean coastline, classic architecture and authentic Italian cuisine will have you wondering why you’ve never heard of this place before. It’s southern Italian culture at its best, but with all the perks of a hidden gem! San Fruttuoso on the Italian Riviera is the site of a tenth-century abbey that nestles in a tiny cove, surrounded by steep forested hills on three sides and a pebbly beach on the other. The Mediterranean is bright green here and sparkles in the sun like an emerald. The abbey and beach are accessible only by boat or foot. There are daily boats from Rapallo via Santa Margerita Liguna and Portofino in one direction and Camogli in the other direction. 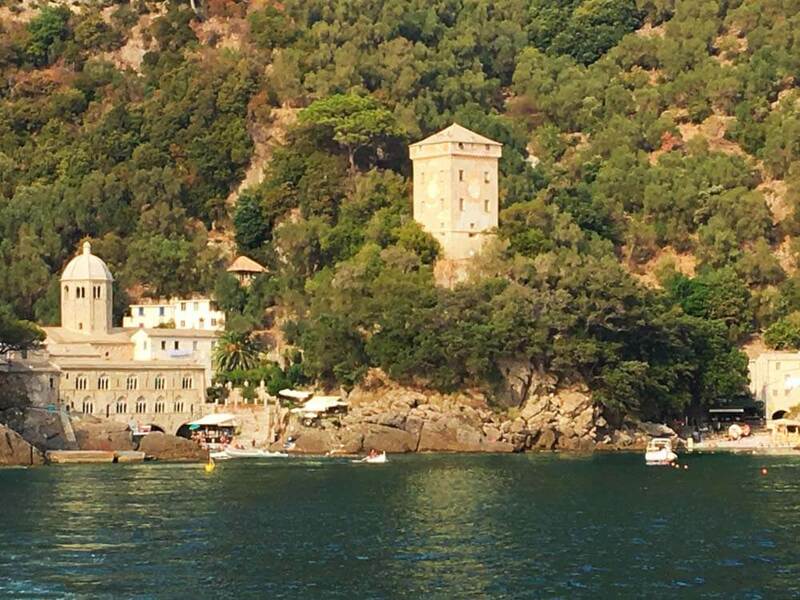 A recommended option is to take the boat to Portofino and then hike from Portofino across to San Fruttuoso. The hike is steep at the start and end, with steps in Portofino and switchbacks at San Fruttuosso, but most of the trail is fairly flat with gorgeous views of the Mediterranean below. When you get to San Fruttuoso, you can rent beach chairs and take a dip to cool off. There is also a small café in front of the abbey. A few hundred meters offshore, there is a famous sunken statue of Jesus, Christ of the Abyss, that is a great dive site. Dive trips leave from Santa Margherita. 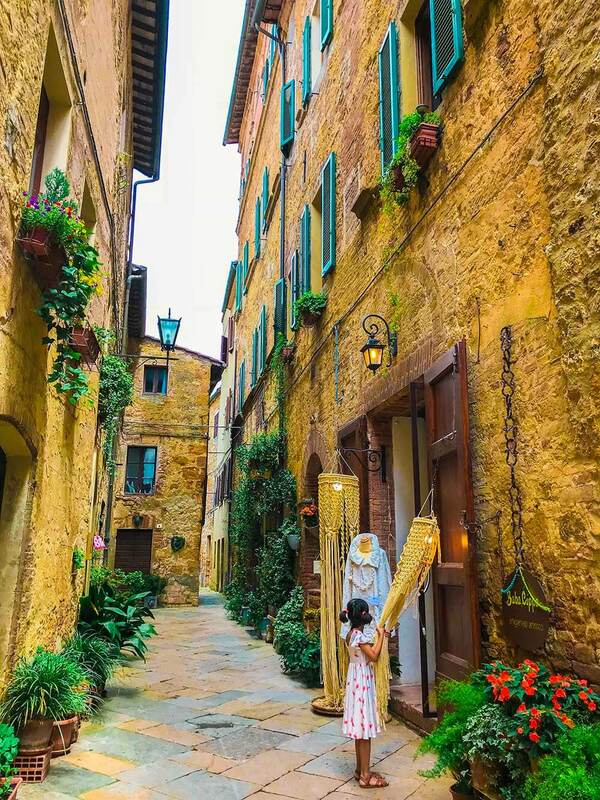 San Gimignano is located halfway between Florence and Siena. As you approach the city, you will notice the distinct and well preserved medieval towers rising out of the town. Once you arrive at the hilltop city, the picturesque surrounding landscape of rolling hills is breathtaking. We sat there looking for miles hardly believing our eyes. It’s hard to believe this tiny little town was once a major city in medieval times. The city has several great restaurants where you can enjoy delicious Italian meals and delicious gelato. During our visit, we stayed in Fattoria Voltrona, a lovely bed and breakfast on the hillside outside the city center of San Gimignano. We had breakfast each morning and one day we enjoyed a horseback ride through the vineyards and olive trees seeing the town in the distance. 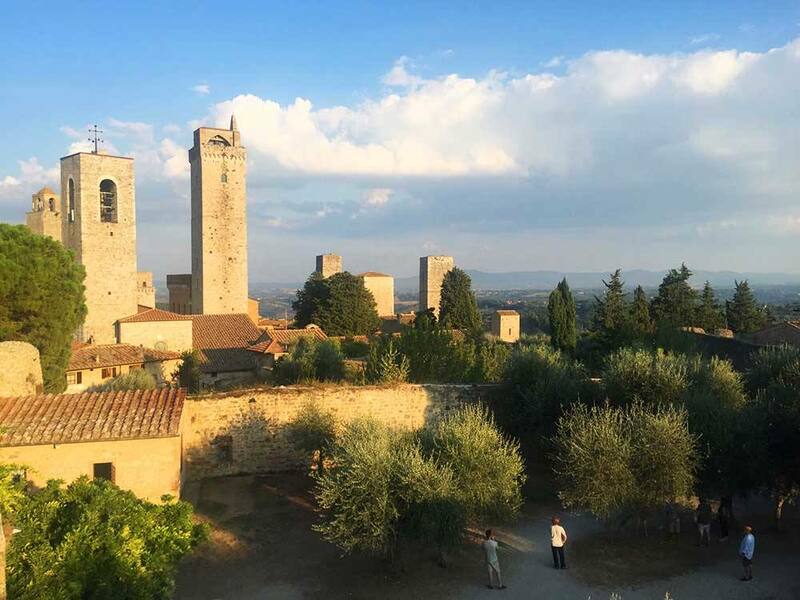 There are so many great places to visit in Italy, but San Gimignano was our favorite. While San Marino isn’t politically in Italy, since it is its own Microstate nation, it is a stone’s throw from Rimini and geographically it is seen to be or combined with Italy for those who travel to the region. Castle fortresses seated up high on mountaintops mark this tiny 61 Kilometre square Republic. Many visit on a day trip to stroll the old town streets and alleyway, the First and Second defense Towers, the Palace (seat of Government) and the old guarding post. Many visitors even opt to get a special passport stamp, since this is technically it’s own country after all! 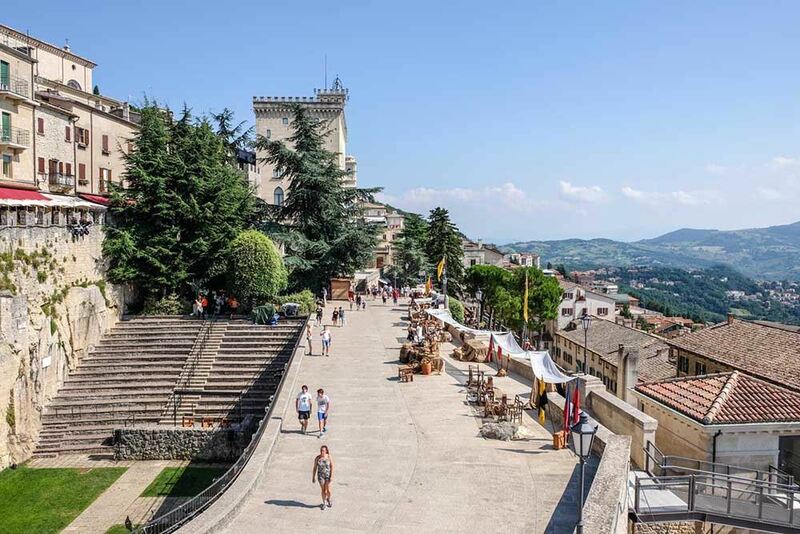 For those with longer time to visit San Marino, you can explore further with short hikes up Mount Titano upon which San Marino stands, or attend the annual Medieval Festival, for which it is renowned. Rome is a natural fan favorite for Italy. But, due to its positioning on the globe, Italy can get quite hot in the summer. On those days, escaping Rome for a beach, to cool off and sneak in some tranquility, is everything. Luckily, there is a prime beach an easy day-trip away! We highly recommend Santa Marinella, as from Rome Central it’s only a short thirty-minute train ride. We found their beach to be clean, relaxing, and just the break we needed from the city. 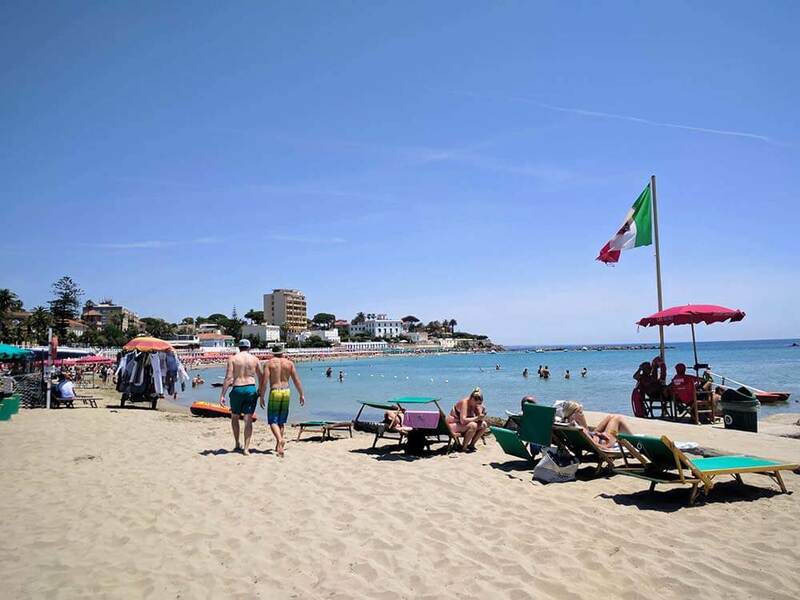 Once in Santa Marinella, it’s merely a five-minute walk from the train station to find ample amenities, food options, and a beach that is attended but not packed to the gills. One of the best places to visit in Italy has to be the island of Sicily. Steeped in history, and the largest island in the Mediterranean, it has everything from the aforementioned history, to stunning beaches, great food and one of the world’s most active volcanoes, Mount Etna. There are some great places to stay in Sicily including the capital Palermo, but along the coast to the east is another great base for exploring Sicily called Cefalu. Other people holiday in the southern town of Catania, in the plains below Mount Etna. As for history, take your pick. 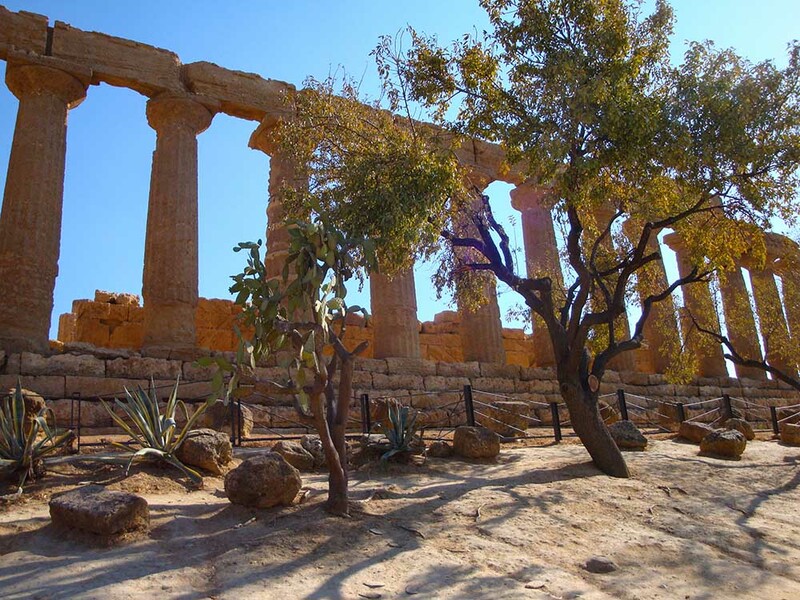 Must-see places on Sicily include the Roman hunting lodge near the town of Piazza Armerina and the Valley of the Temples in Agrigento, both of which are UNESCO World Heritage Sites. There are an additional five UNESCO sites on Sicily. And the best way to experience Mount Etna from all sides is on the back of a motorbike. My hubby and I rode from Cefalu to Catania and rode up the Catania side of Mount Etna and back down the Taormina side (another amazing town on the island), before riding the less-traveled roads at the rear back to Cefalu. It was an unforgettable ride with the volcano in the background. And the day ended perfectly with an amazing calzone pizza and a bottle of Chianti. Siena is a small city in Tuscany, Italy. 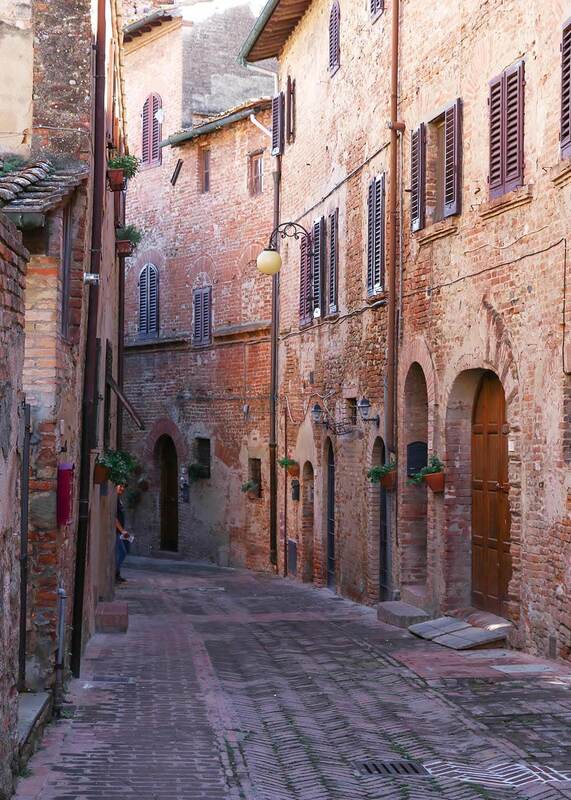 In 1995, the historic center of Siena was added to the UNESCO World Heritage list. Perched on top of a hill and based around the central Piazza del Campo, Siena is a picturesque Italian town. It is well known for its beautiful black and white cathedral, the Duomo. Taking over 200 years to build, it was intended to be the biggest in the world but by the time it was finished others had surpassed it. Siena is also famous or it’s horse race, the Palio. The first race was run in the seventeenth century and it is still held twice a year. The Contrade (or wards) of Siena compete fiercely as the horses charge around the Piazza del Campo. While there is plenty to do in Siena, my favorite way to pass the time was taking a seat in one of the bars or restaurants around the Piazza del Campo, enjoying an Aperol Spritz and watching the world pass by. Some of the places offer seats on the second-floor balcony, for an even better view. Don’t forget to try some of the delicious local gelato while in Siena too. Syracuse, or Siracusa in Italian, is an ancient town that was originally founded by the Greeks. Many of its impressive archaeological sites, such as the Greek theater and the Necropolis, were built several centuries before the Roman Empire. Many of the buildings standing in Syracuse today are from later periods, particularly the Baroque period. The historic center is known as Ortigia and is actually on a different island, separated from the rest of Sicily by a narrow water channel. Wandering through the narrow alleyways of Ortigia, and getting lost on purpose, is the perfect way to spend an afternoon in Siracusa. In the morning, you’ll want to head to one of the city’s fruit and vegetable markets, filled with Tarocco blood oranges, wild fennel and many different kinds of nuts, all grown in the neighboring countryside. Siracusa is also the perfect base for some day trips to other famous Baroque towns in the area, like Noto, Ragusa and Modica. The latter is famous for its chocolate, which is made using the same technique that the Aztecs used at the time of the Spanish conquest. It’s just one of the many dairy-free, vegetarian and vegan specialties of Sicily. 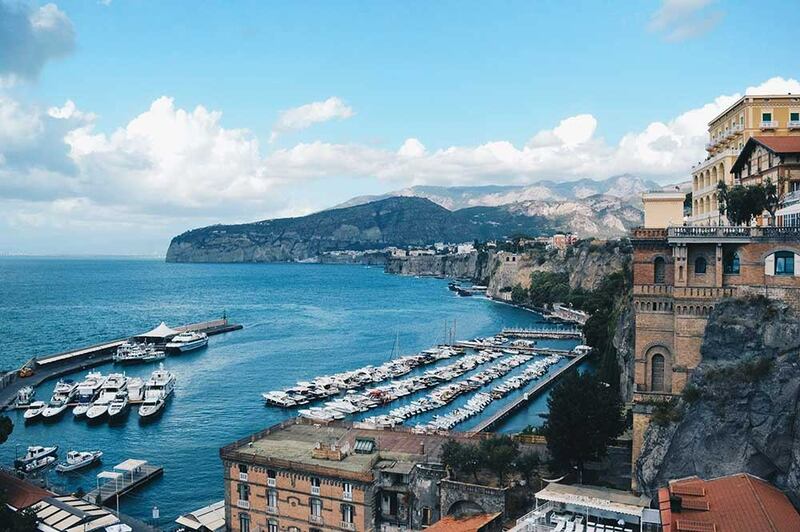 Sorrento is a lovely day trip that is easily accessible by a 1-hour train from Naples. It is a coastal town with several good private beaches costing less than $10 per day for a locker and an umbrella. You could also take a walk along the cliffs to enjoy the views of the sea. If you walk down to the docks, you can also enjoy some seaside dining (think waves lapping up into the restaurant!) for a very reasonable price. Since this is also a fairly touristy town, there are a fair number of shops to buy the usual Italian souvenirs, including limoncello, pottery, and other fun items. Trentino is located in the north of Italy and has some of the most spectacular landscapes in the country, with imposing mountains, majestic lakes, and countless numbers of quaint valleys and cute villages. It’s a destination that you can visit all year round and it will feel different every time. In autumn the colors come out setting fire to the region’s palette, in spring the apple orchards turn it into a blossom lover’s paradise, in summer the mountains are the perfect cool retreat from the heat, and in winter it offers some of the best skiing in Europe. I particularly love the winter in Trentino, when the valleys and mountains turn in to a winter wonderland. Even if you are not a skier, there is plenty of awesome things to do. 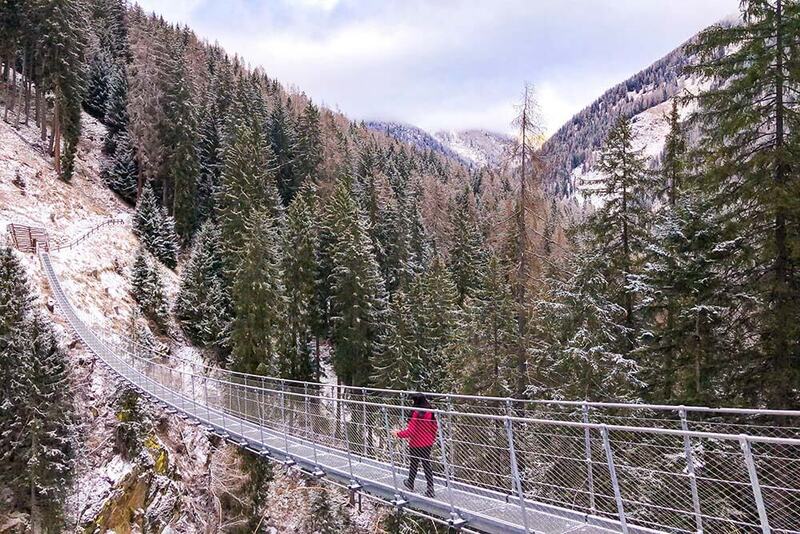 Hiking in the snow will bring up surprises like frozen waterfalls and suspension bridges, the cold crispy air will call for a day in a cozy farmhouse learning how to cook local traditional dishes, or spend a day in a spa with breathtaking views over the Dolomites Mountains. But no matter what time of the year you go, Trentino is guaranteed to make you fall in love with it. 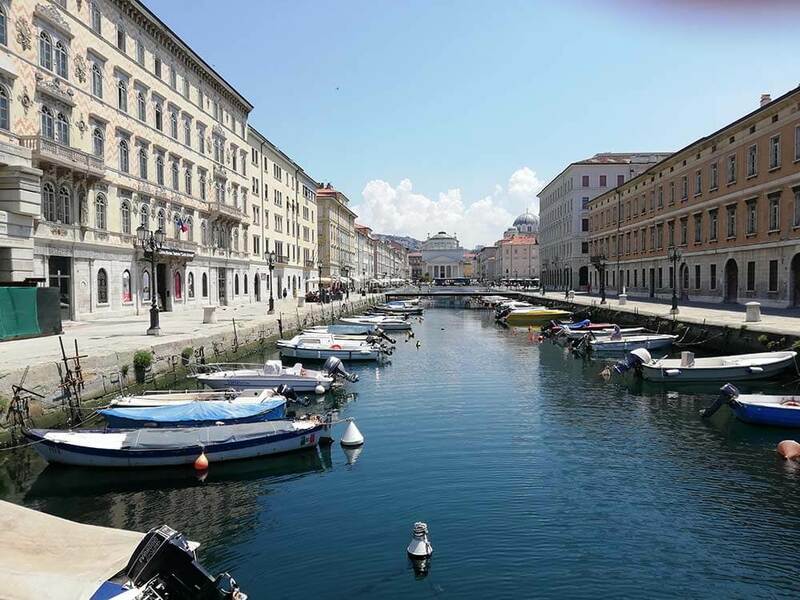 Trieste, an Italian outpost on the North East Adriatic coast, is often overlooked by travelers to the Italian peninsula! But as I recently discovered whilst traveling to Slovenia, this often windswept city is a gem not to be missed. As you wander around, especially in the Old Town area, you can see influences from the Venetians, the Romans, as well as the Austro-Hungarian Empire. The magnificent main square, Piazza dell’Unita’ d’Italia, is said to be the largest sea facing square in Europe. It is as stunning as it sounds. If Roman ruins is what you’re looking for, then a short walk from the main square you will find the ruins of a Roman theatre too. Another great feature of this seaport city is its Canal Grande. The canal is flanked by churches and squares, and historical buildings housing cafes and museums. It’s the perfect spot for a sunset stroll to take in the melancholic charm of the place. Being the birthplace of Illy, Trieste is also known for its cafe culture, though don’t expect the typical lively, down-your-espresso-shot at the counter kind of bar that is ubiquitous in Italy. Think more sophisticated with fancy cakes and coffees that wouldn’t be out of place in Vienna. From the grand architecture, like Castello Miramare just north of the city, and the numerous palaces, to the rich literary and cultural heritage, Trieste has much to offer. It’s a must add to your Italian itinerary when visiting the northeast of Italy or Slovenia. 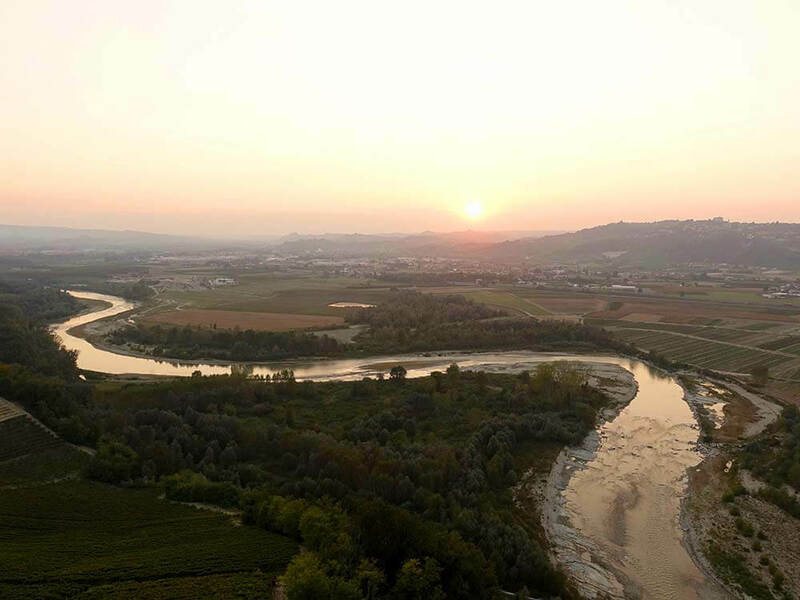 I discovered one of my favorite cities in Italy by accident… Turin was merely the closest city with an airport from Alba, where I had spent a week exploring the Piedmont wine region. But, Italy’s fourth-largest city stole my heart the moment I stepped off the train. Its beautiful architecture, history, and variety of things to see and do – not to mention the food and wine – make it a great spot to soak in Italy when you’re in the Piedmont region. A few things I suggest you do when you visit include, visiting the Cathedral of Turin in Piazza San Giovanni where you can see The Shroud of Turin – believed to be the burial shroud of Christ. Take in the Roman ruins, they’re everywhere. Visit the Egyptian Museum, the largest Egyptian collection in the world outside of the Cairo Museum. And ride the historic tram – Linea 7 Tram Storici, which takes visitors on a circular tour of the city and many of its sites. If you can steal away to the river for a stroll, then make it happen! Need more ideas? I’ve got a whole slew of them here. Turin, or Torino, is often overlooked as one of the best places to visit in Italy. But if you fail to stop by, then you’ll be missing out. Turin is a stunning place, thanks to the Italian Alps acting as a beautiful backdrop to the northwest of the city. A trip up the Mole Antonelliana will give you 360-degree panoramic views and it’s truly breathtaking. There is also an awesome cinema museum there too. Turin is a city famous for its chocolate making, and you’ll find authentic Italian restaurants, delicious gelato, and jugs of sparkling wine for a lot less money than you’d find in other parts of Italy. Turin is also home to the biggest archaeological collection of Egyptian artifacts outside of Egypt and it’s a fascinating museum. There are also lots of beautiful gardens and bridges, perfect for packing an Italian style picnic and simply relaxing in the sunshine. Turin is a small city with a unique and authentic Italian charm. It’s one of my favorite spots in Italy and definitely one of the best places to visit; which is probably why I spent my 24th birthday there! With Rome, Venice, Florence, and Milan all competing for attention in Italy, Turin, or Torino is often overlooked by foreign tourists. And that’s precisely why we love it. The wide streets are free from overcrowded tour buses, long queues, and hordes of people flocking from one must-see sight to the next. While Torino doesn’t have The Coliseum or canals, it does have plenty of noteworthy attractions. View the Mole Antonelliana, Torino’s famous spire, from the outside, then head indoors to ride the glass elevator all the way to the top — if you dare! Film buffs should not miss the National Cinema Museum, while foodies should pick up some locally sourced Italian products at Eataly. And, of course, viewing the famous Shroud of Turin might be on your bucket list. 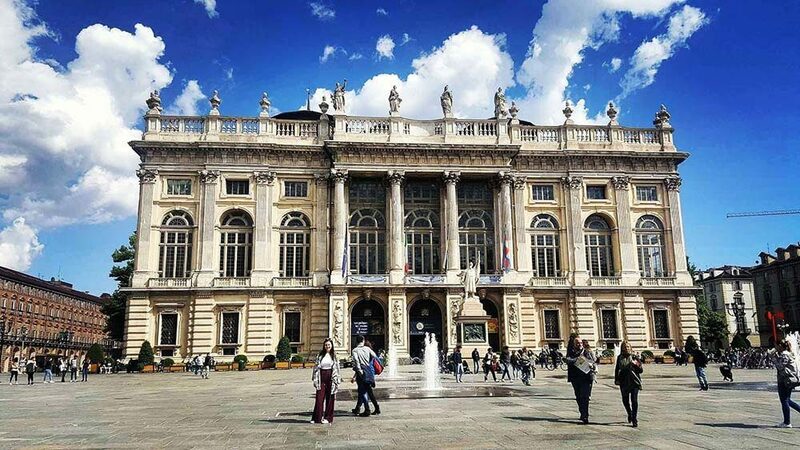 By far our favorite thing to do in Torino is to wander the glorious colonnades and porticoes until it’s time to take a seat in Piazza Vittorio. Here, you can order Torino’s signature drink, the impossibly rich, chocolate-infused coffee known as Bicerin. Then sit back alongside the locals and simply watch the world go by. 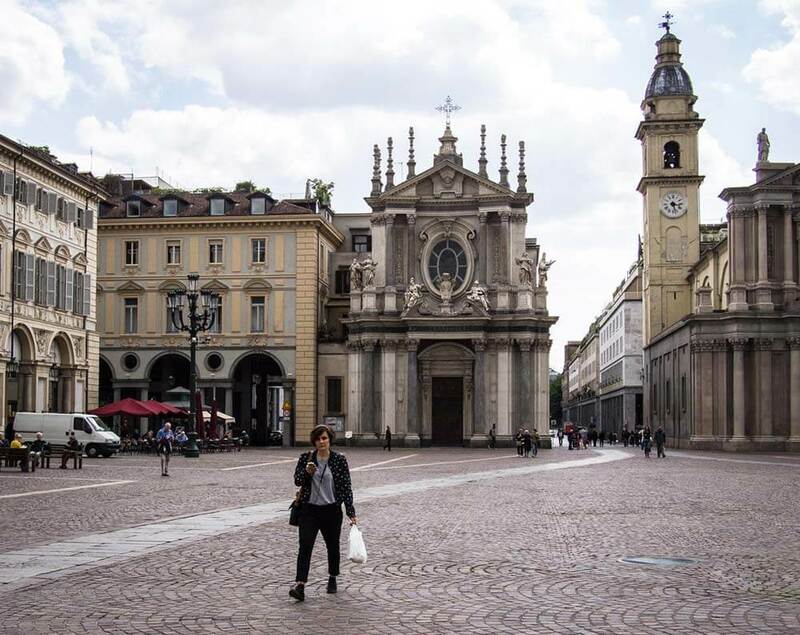 You can comfortably visit Torino on a day trip from Milan but we suggest you spend a few nights to re-learn the meaning of slow travel in our favorite Italian city. The class is run just like your grandma would run a kitchen. You are welcome to help with anything you want or just sit back and watch. The older boys favorite part was making the pasta! While things are in the oven explore the property with a pool, wine tasting (with kid-friendly grape juice) and animals. The class culminates in a family style meal which you just made. This was truly one of the best family events we’ve ever booked and the kids would say the same. 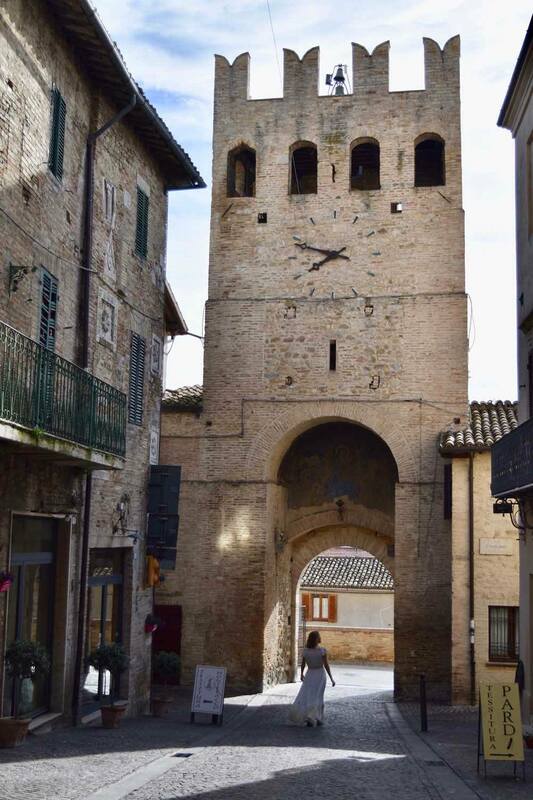 Umbria is the perfect place to visit in Italy. It’s easily as beautiful as Tuscany, with half the tourists, full of stunning hilltop towns, gorgeous churches, and picturesque countryside. 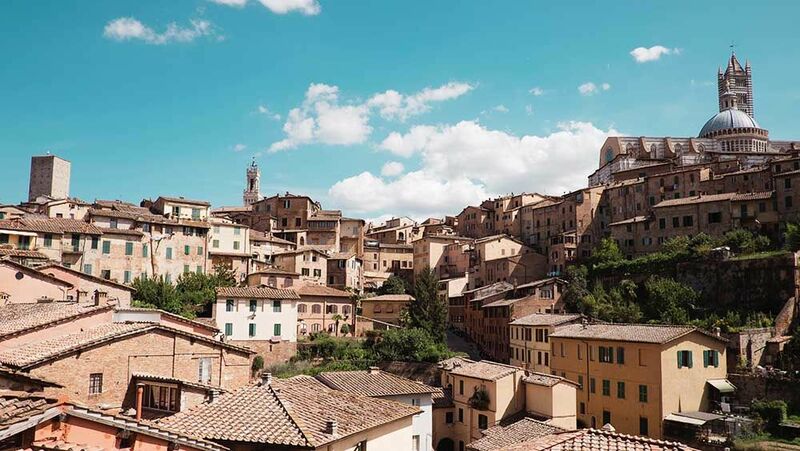 Though there is plenty to see and do, it’s compact enough that you can enjoy a long weekend in Umbria and manage to take in a couple of towns and sights. The food isn’t bad either! In Umbria, you can find delicious truffles, amazing wines including eleven DOC and two DOCG wines! Don’t miss the beautiful town of Spello, with narrow lanes full of flowers, still contained within ancient Roman walls, or the impressive castle and Roman aqueduct in Spoleto. End your trip enjoying the views of the Valle Umbra from Montefalco while sipping a glass of Sagrantino de Montefalco! As the smallest sovereign state in the world, Vatican City is probably one of the richest countries, monetarily-speaking, as well as in its significance and history. There are simply so many things to see inside the fortification boundaries of Vatican City! Travelers who’ve done their research know that there are even more unusual Vatican City tours, like exploring the necropolis Scavi tour underneath the Basilica. 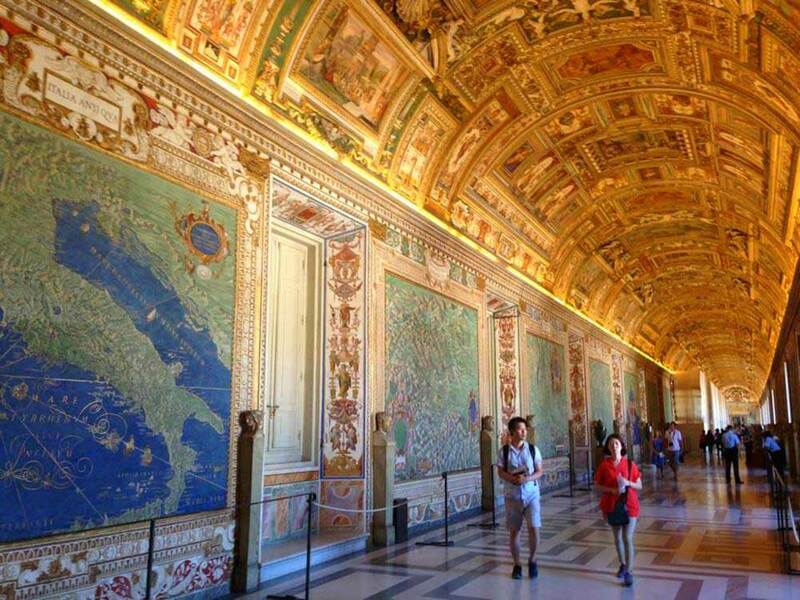 Qualified researchers and scholars may visit the Vatican Library. These relatively unknown activities require planning, but are definitely worth doing! Mention you’re visiting Venice and you’ll likely be told that it’s so overcrowded, one of the most popular places in Italy, and it’s no longer worth visiting. It is one of the top places in Italy for tourists! No-one can deny this small city is incredibly popular with tourists. But Venice is a must see in Italy! 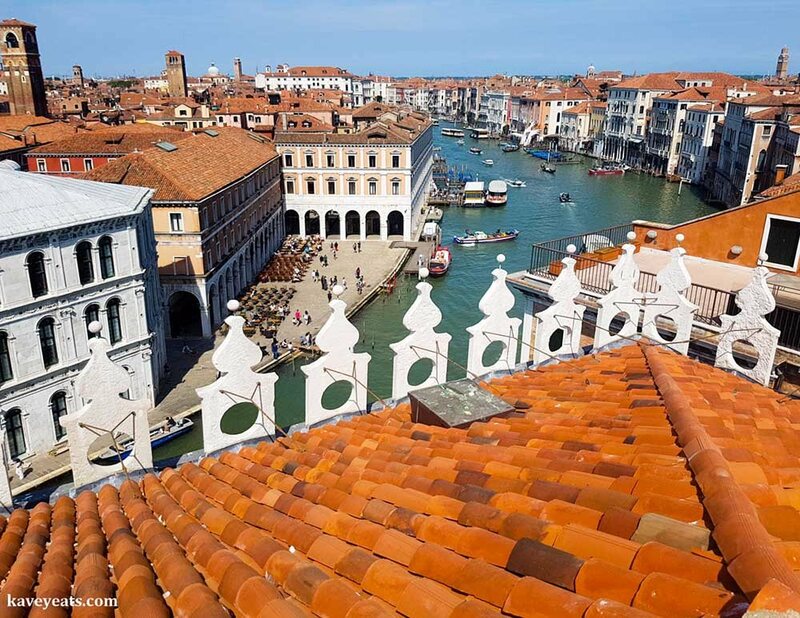 However, the magic of Venice remains intact, especially for travelers willing to explore beyond the main tourist sites. Of course, you must see the magnificence of the Piazza San Marco and its incredible Basilica, Campanile and Doge’s Palace. 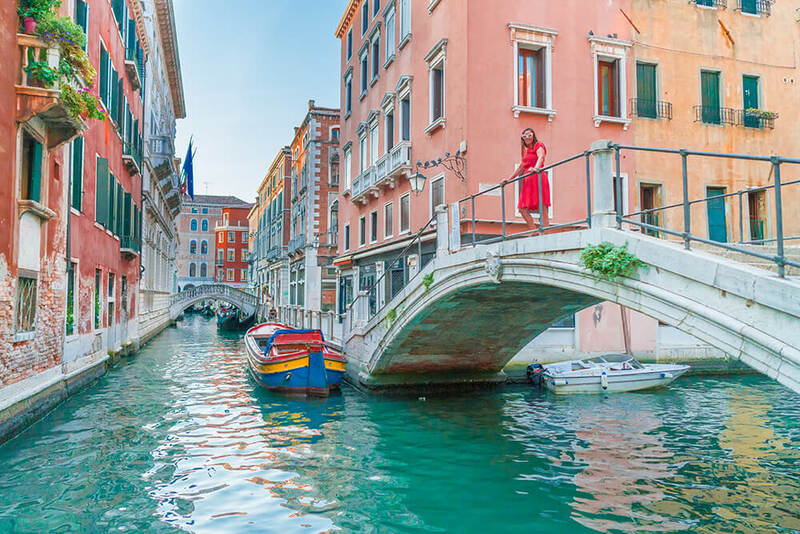 And you don’t want to miss the beautiful Grand Canal, lined by grand mansions and palaces, plied by water-buses, gondolas and delivery boats. The Rialto Bridge and nearby Mercato (food market) are not the calmest places to shop, but fascinating nonetheless. But the further away you meander from these big attractions, the more you will discover quieter lanes and waterways, with homely residential dwellings. 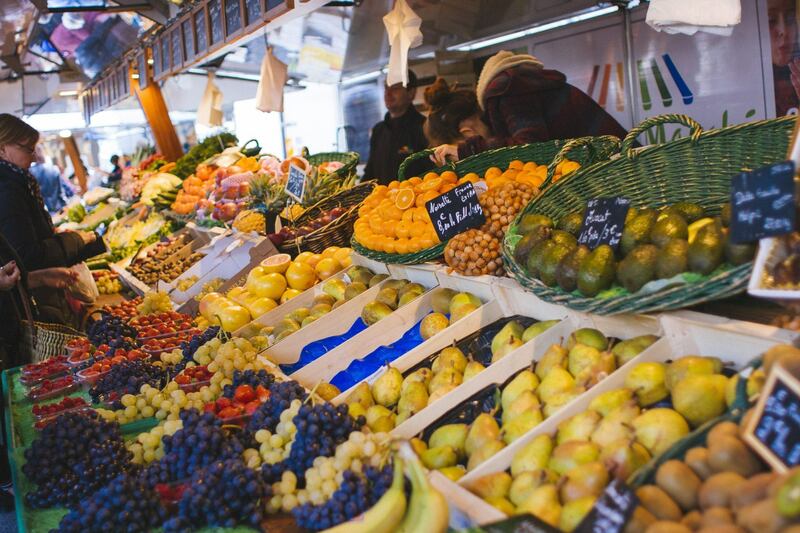 Here you will find the fruit and vegetable markets where locals shop, and quieter cafes, restaurants, and bars. 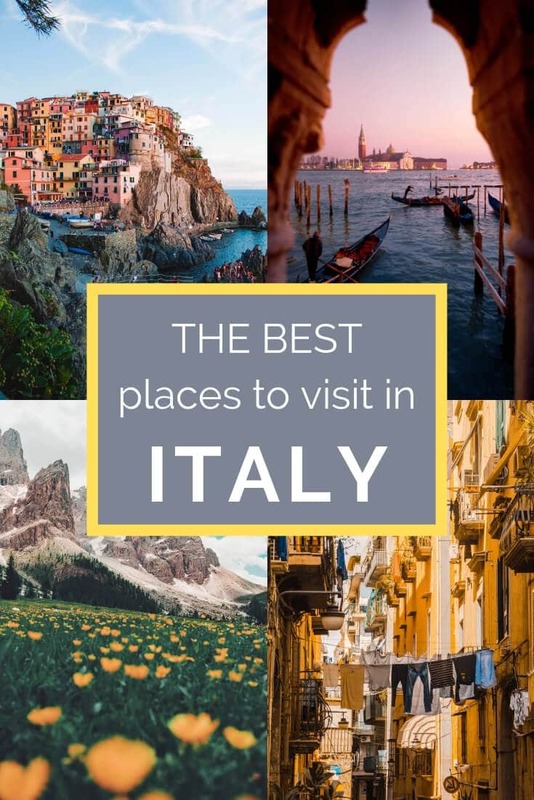 Also give yourself time to visit the islands of Murano (for its glass production), Burano (for its brightly colored house), and peaceful San Michele (the city’s cemetery). Don’t believe those who say you can’t eat well in Venice. Eating out is more expensive than most of Italy, given the need to bring everything in by boat, but it is definitely possible to find great food in Venice: Look for restaurants and bacarai (bars) offering Venetian dishes and Cicchetti, research travel blogs in advance, and ask your hosts for personal recommendations. Avoid the peak months of summer when tourists are at their most numerous, and can still discover for yourself the charms Venice! Located in the Gulf of Genoa, the small seaside town of Ventimiglia is the perfect place to enjoy the Italian Riviera. It has the distinction of being the last town of Italy as the French border is just seven kilometers away. Nevertheless, there are quite a few ways to enjoy the city. You can walk along narrow and winding roads in the old quarter that is located over a hill or explore the new town that runs along the coastline. Apart from the medieval Old Town, other attractions in Ventimiglia include the Roman baths and theatre, Romanesque cathedral, San Michele Archangel church, Hanbury Gardens and the quiet promenade with hardly any tourist infrastructure. The wild experience of just you and the sea alone makes this a place worth visiting in my opinion. On Fridays, there is a huge flea market where you can also sample authentic Italian fare. It is also the perfect venue to interact with the lively locals. And of course, once you’re done and in the mood for some culture shock, breezing into Menton in France or Monte Carlo in Monaco is just a short hop away. Ravello, Italy sits perched on a cliff over the town of Amalfi, overlooking the beautiful Amalfi Coast. 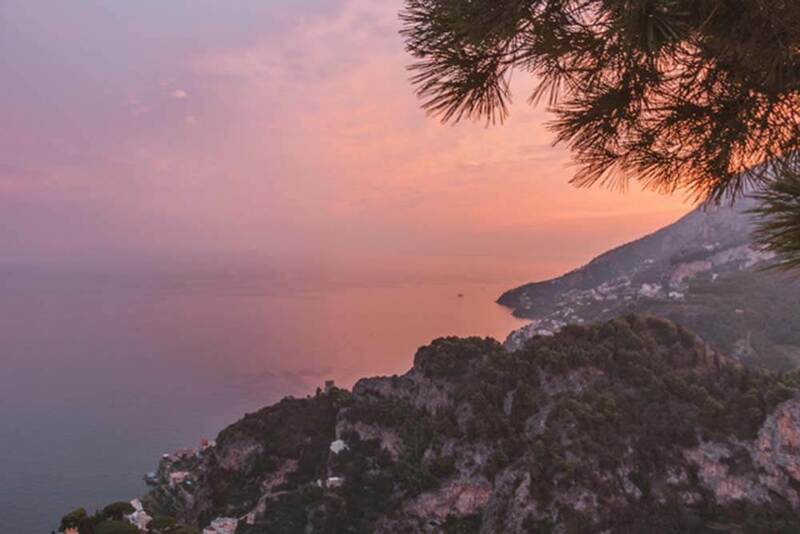 Because of its towering location, which can be reached by a harrowing bus ride, expensive taxi fare, or strenuous hike, Ravello doesn’t see the same number of visitors as other popular towns along the coast like Positano. This quieter atmosphere, combined with picturesque piazzas and cobblestone streets, along with stunning views, make Ravello a must-visit destination when in Southern Italy. Ravello is known for being a city of music, with classical open-air concert performances throughout the summer. The town is also popular for the gardens at Villa Rufalo and Villa Cimbrone. 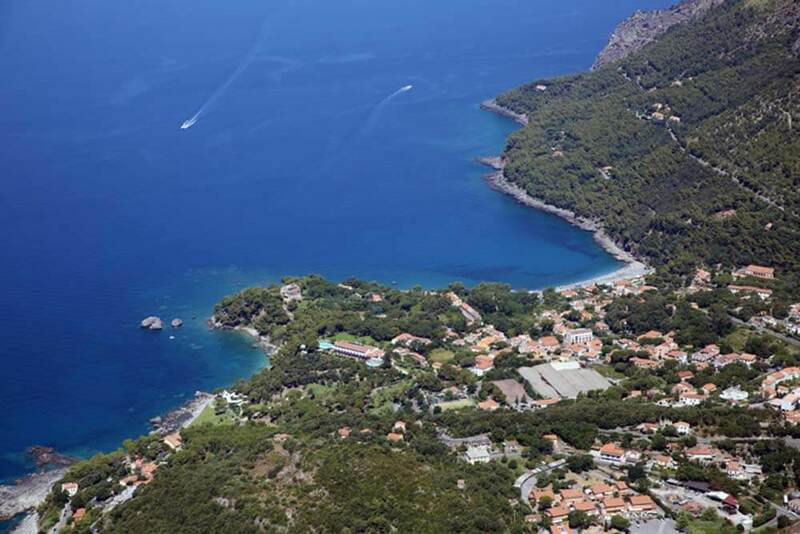 Villa Cimbrone dates back to the 11th century and is a popular destinations for weddings. While it is also home to a five-star hotel, the gardens are open to the public (for fee) and is one of the most memorable destinations on the Amalfi Coast. You cannot miss taking in the view from the Terrace of Infinity. The terrace is lined with marble busts and it seems as if you can see forever out over the beautiful blue water and terraced hills below. Villa Romana del Casale lies about two hours from Agrigento coming from the northeast, in the culturally fascinating island of Sicily. It sits in a quiet, unassuming spot on a dry plain that belies its stature as a UNESCO World Heritage site. 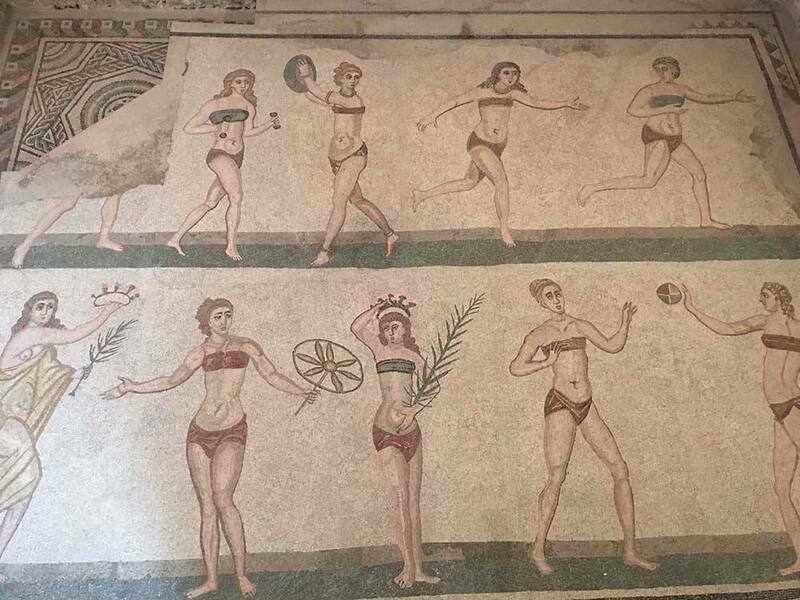 In fact, Villa Romana houses the best preserved and most outstanding collection of Roman mosaics in the world. Dating from the beginning of 4th Century CE, the villa resembles more a palace than a mere villa. It was a splendid, shining structure for almost two centuries before falling victim to vandals. Further deterioration occurred during the Byzantine and successive periods. In the 12th Century CE, the graceful villa with its soaring columns and vivid, vibrant mosaics was buried in a landslide and forgotten. In the early 1900s pieces of mosaics were unearthed piquing the interest of archeologists who investigated further. Little by little the area was excavated until the full scope and magnificence of the Villa were discovered. The villa is an extraordinary achievement and worthy of a visit as Agrigento. Viterbo is one of the most underrated places in Italy and almost always entirely overlooked. Located in the Lazio region just one hour north of Rome, the tiny towns and lesser-known attractions of the region are often cast aside for a trip to Italy‘s most famous city. 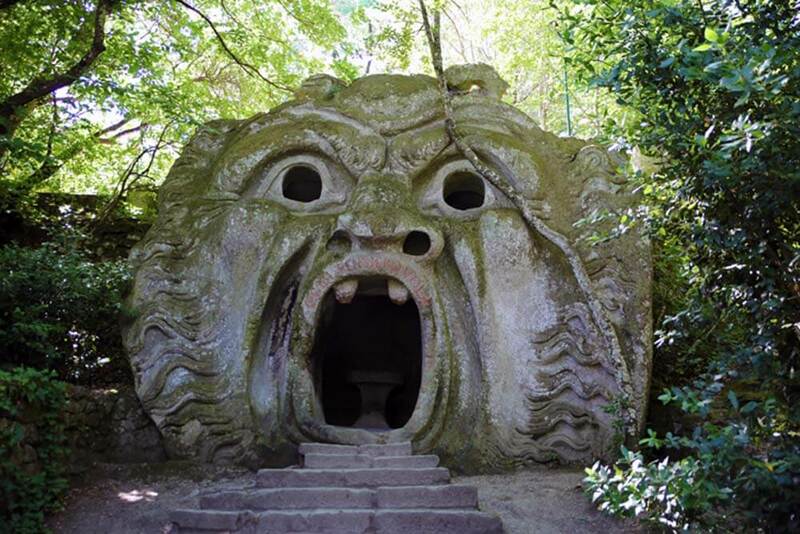 But head to Viterbo and you’ll find yourself completely alone as you wander the Parco dei Mostri di Bomarzo, a fantastical park built by Price Pier Francesco Orsini in the 16th century. The park filled with larger than life sculptures of monstrous faces and exotic creatures fell into disrepair and was nearly lost as vegetation took it over. It was rediscovered in the 1970s and is an absolute gem to wander through. 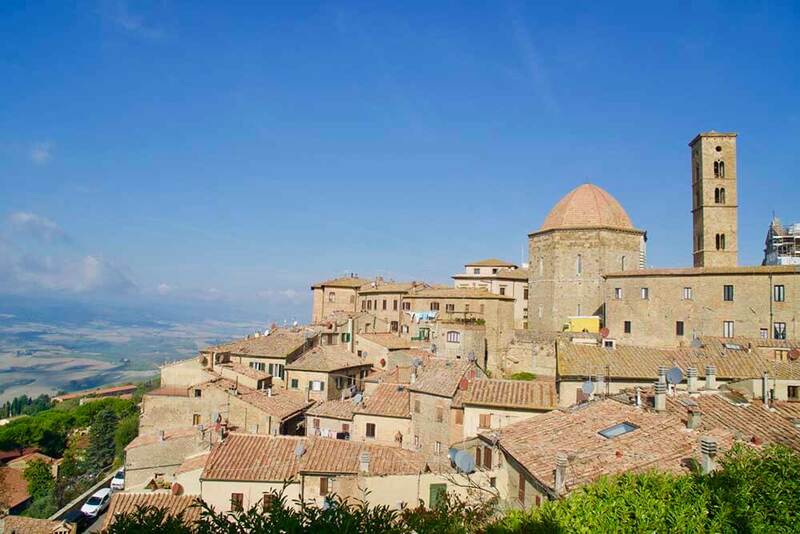 One of our favorite places to visit in Italy is the town of Volterra. This picturesque village is about an hour from both Florence and Siena, and is best reached by car. Public transportation is available but is not the most efficient. Volterra’s foundations date to Etruscan times (4th to 1st centuries BC), and visitors should spend time exploring the remnants of the 4th century city walls, wandering the cobblestone streets, visiting the Etruscan Museum and Porta all’Arco (one of the main gates built by the Etruscans). Consider spending some time at the Roman Theater ruins, one of the best preserved in Italy. The site dates to the 1st century and includes the ruins of an amphitheater, forum, and baths. 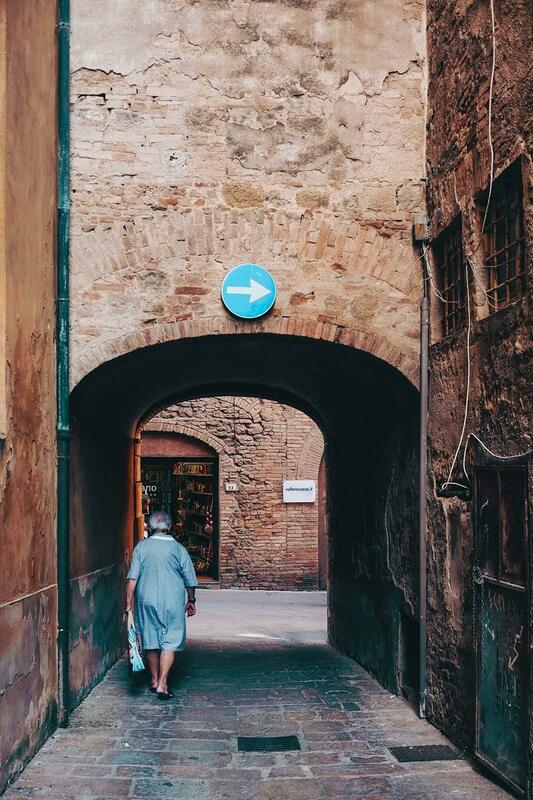 After a walk through the ruins, be sure to wander the through the charming town of Volterra. Stop at one of the many alabaster shops for a souvenir, and spend time people watching at Piazza dei Priori, the main square. If you have time, don’t miss the Guarnacci Museum, one of the oldest public museums in Europe that features Etruscan urns and Roman mosaics. 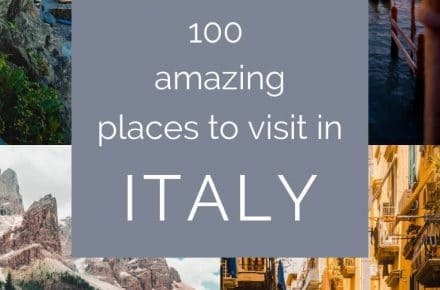 I hope this list of the best places to visit in Italy has helped you to decide where you want to go and which cities you want to prioritize during your time in this amazing country. I’m confident that wherever you choose will be full of magic and memories! I’d love to know where you end up visiting and I’d love to hear from you and see pictures. You can connect with me on Facebook or Instagram. Please don’t hesitate to reach out. I love helping you plan your vacations! Love this post! This is definitely my go-to if in ever go back to Italy! Thanks Shel. So much goodness here! My bucket list keeps growing! I need to get back to Italy ASAP! Thank you for a fantastic summary. More bucket list cities in Italy. Thanks so much Jennie. Seriously sooo many incredible places in this beautiful country. It could take a lifetime! Verona didn’t make the list?! Ah you are so right! That definitely needs to be added!